Nomad's Diary – Travel. Enjoy. Learn. Share. It’s absolutely TRUE. It is by taking risk and getting out of your comfort zones that one can truly understand the real meaning of the word adventure. We only live once so we spiced up each passing moment with exciting adventures with friends and loved ones. I remember it was four o’ clock in the morning of May when the moonlight still filled my room; I was awakened by the infuriating sound of my alarm clock which droned my ears like the buzzing sound of the bees. I hurriedly took a bath, got dressed and heaved the backpack to catch that 4:30 ride with my daughter and friends. It was an early morning trip to the north heading to our summer destination. It was raining when we arrived at San Carlos City where we took another bus that brought us to the city of smiles. It was a long but awesome trip for we enjoy the pleasure of seeing the treats of the countryside. Along the way, as we have kept our eyes opened we have seen beautiful and lovely sceneries. We passed by the mountains permeated with withered brown grass which obviously burned under the scorching summer heat making it looked like chocolate hills of Bohol; amazed by the green lush trees and sugarcane fields; and relieved by the fresh pine scent at Don Salvador, Benedicto which known to be the little Baguio of the north. Those made me somehow oblivious for a while of life’s mundane concerns. 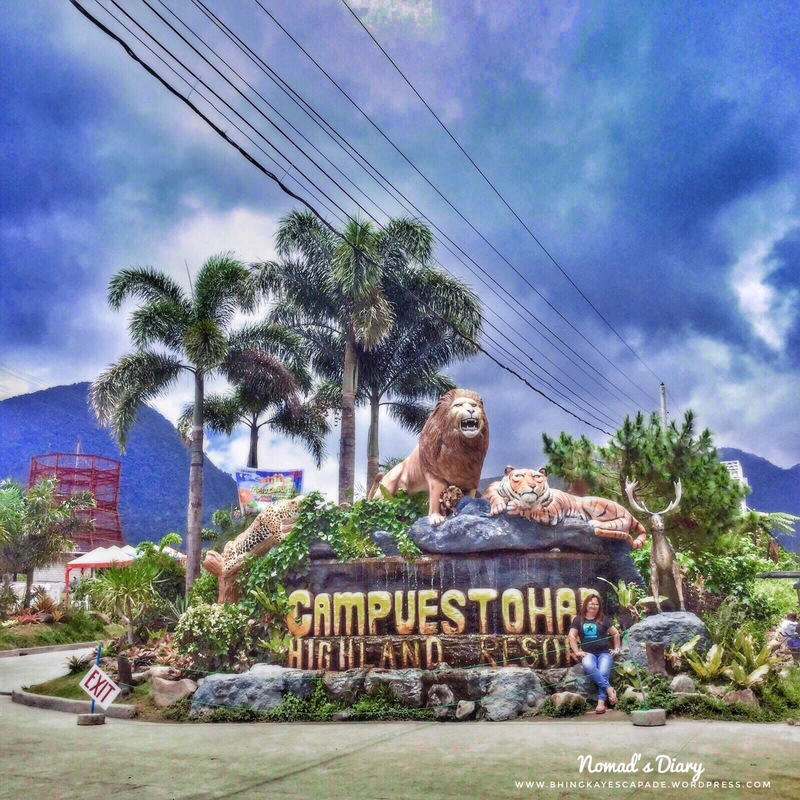 Hours later, the bus buzzed like a sound of angry hornets telling the passengers to come down the stairs for we had reached our destination, Bacolod, the city of smiles and gateway to one of the famous tourist destinations in Negros Occidental, Campuestohan Highland Resort. 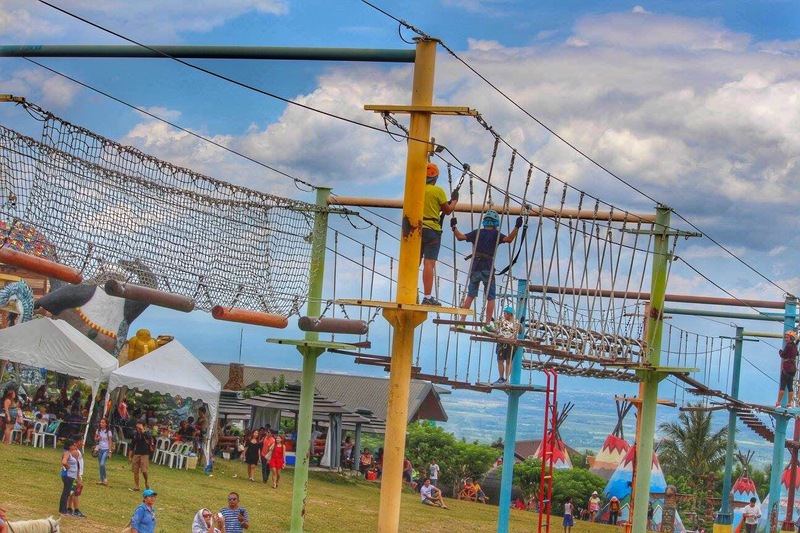 Screaming from the top of my lungs, I stood in the entrance of the resort awed and mesmerized by the beauty of this enchanting adventure park, standing 800-meters above sea level situated above the city of Talisay, half hour drive from Bacolod City Negros Occidental, Philippines. 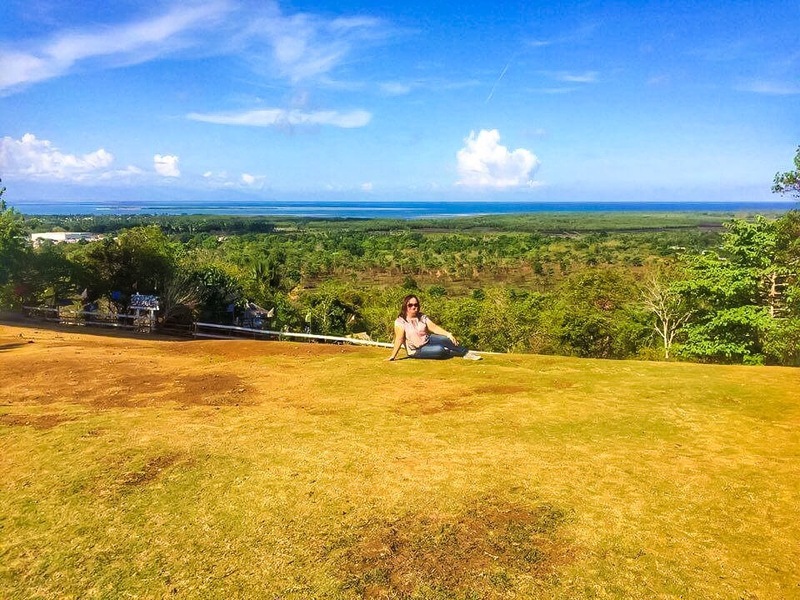 I finally found refuge in this beautiful haven with its gorgeous vista of Mount Makawili and breathtaking views of Panay and Negros Occidental islands. On that bright sunny day, as I strolled around the place invaded with visitors of all ages I suddenly felt a relief when the cold breeze whipped and touched my skin. Comforting, isn’t it? There is no better way to escape life’s daily grind than kicking it off with an amazing experience that is worth keeping. 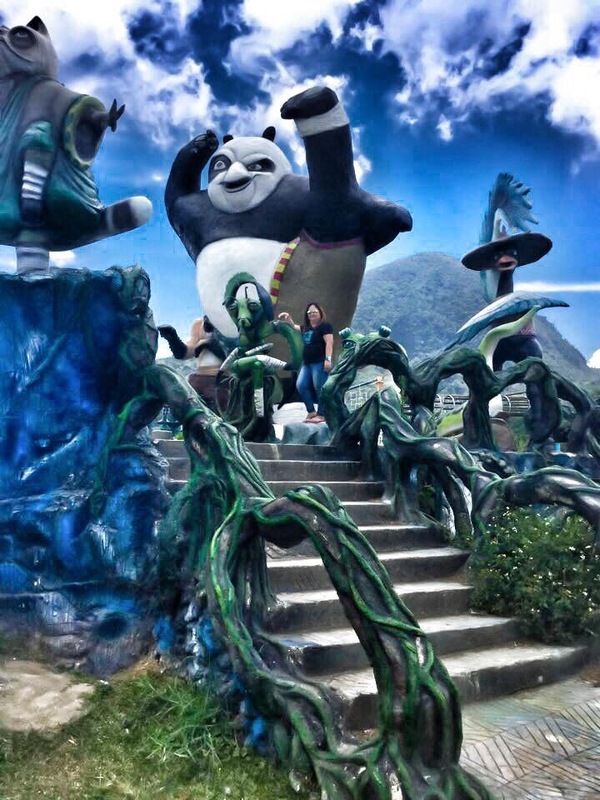 While my friends had their best time conquering fears by zipping through the air while enjoying the beautiful scenery of the resort and taking the jaw-dropping cable hamsters and sky bicycle rides which I never had the guts to do, I was also enjoying taking a snapshot of this huge human-sized statue which reminds me of an epic journey of a fat panda who showcased his signature belly hit in one of the Disney movies, Kung Fu Panda. 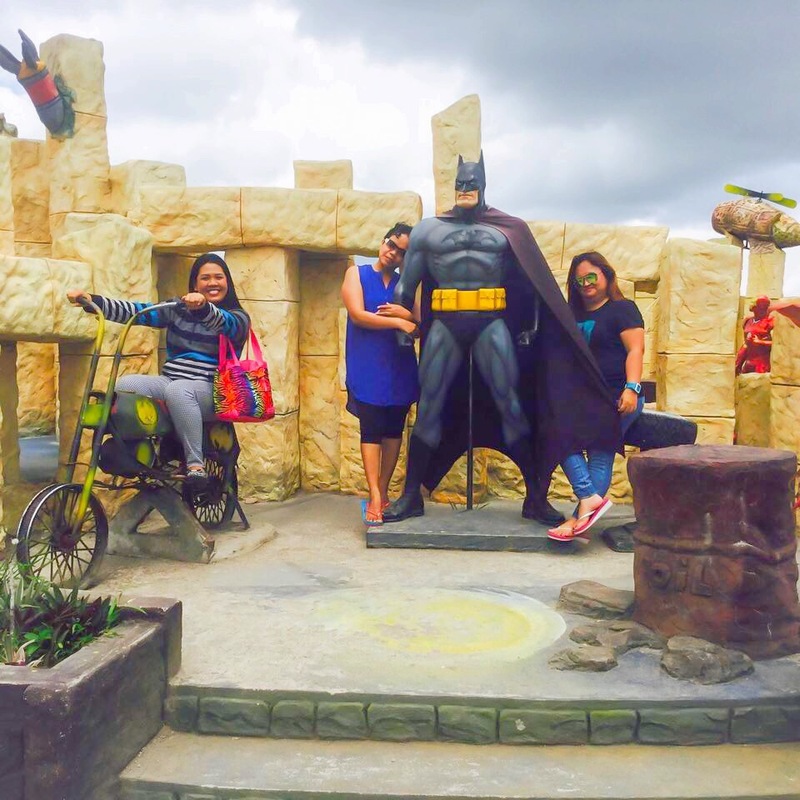 I stood beside other huge statues of Batman, Superman, Wonder Woman, mighty King Kong, Thor and suddenly reminded of the gripping tales of heroes and villains. Then, one…two…three……. the shutter clicked……… as our fellow visitor took our groupies and selfies of that day. I strolled around to explore and look for a perfect spot to capture the breathtaking panorama; I gazed in awe when strikingly vibrant cone-shaped huts suddenly appeared my sight, alas, I was standing at the Indian village. It seemed I have transported by the wheel of time to a Native American epoch when nomadic tribes of the Great Plains built teepees (cone-shaped huts) as their home. Jaunting through the wheel of time again and taking me back to Mesozoic era, the dinosaur age as if time stood still I thought while looking at those dinosaur replicas and wondered if by destiny I were born when the dinosaurs have existed, “Am I going to survive?”, I asked myself. Thank heavens I belong to the generation X. It was two in the afternoon when I slowly began to feel the summer heat and the aching thighs and toes as if I was chased by the dinosaurs and hunted by the Indians and ran a mile so I went to the ice cream parlor for refreshment and because of exhaustion I failed to notice that I have finished ten scoops of ice cream. 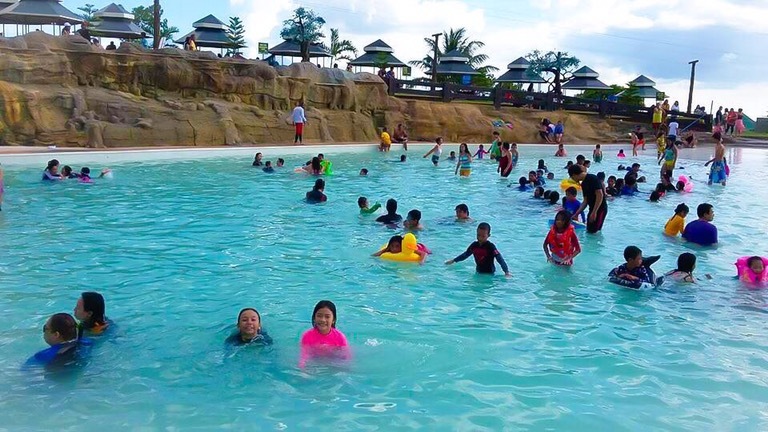 It’s time to pack things up after capping the adventure with a bang by dipping into the newest shark wave pool. It was really a blast. Why go somewhere and spend much when you can save and have everything you’re looking for stored in one place. Go no further for this place has a lot to offer. Satisfy your cravings by treating yourself and your family with tasty and delicious food served at the resort. Get lost with its mesmerizing views which hypnotize every wanderer’s soul. 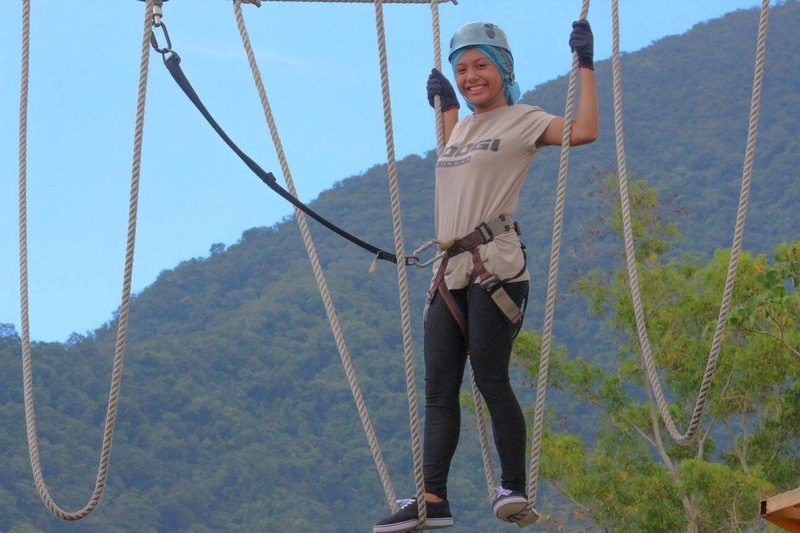 Invigorate your soul through indulging exhilarating and adrenaline rushing activities that will help you forget the worries of the world. Soothe your aching muscles with its cool and relaxing weather. 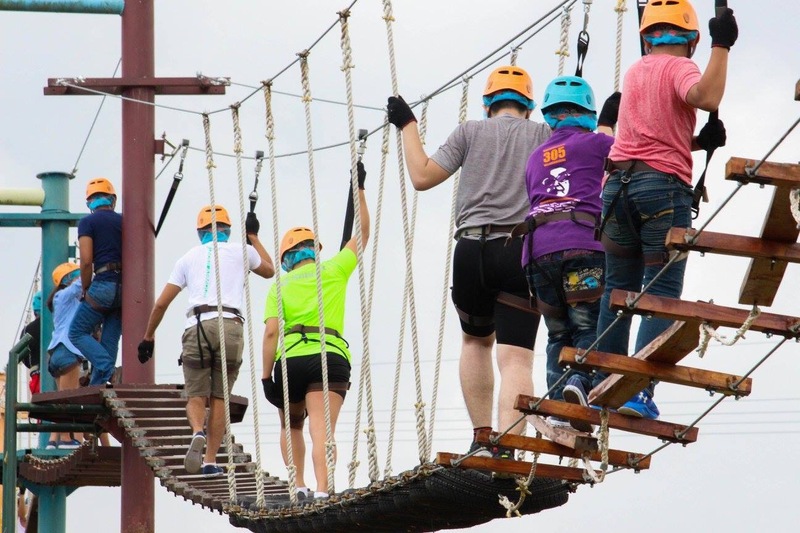 Get high through jumping high into the air by taking their trampoline and experience how it feels to be flying the trapeze. Unleash the child in you by riding the carousel and feel how it is like to be a kid again by visiting their playground where you could have a lot fun. So pack your things up and have fun at Campuestohan. 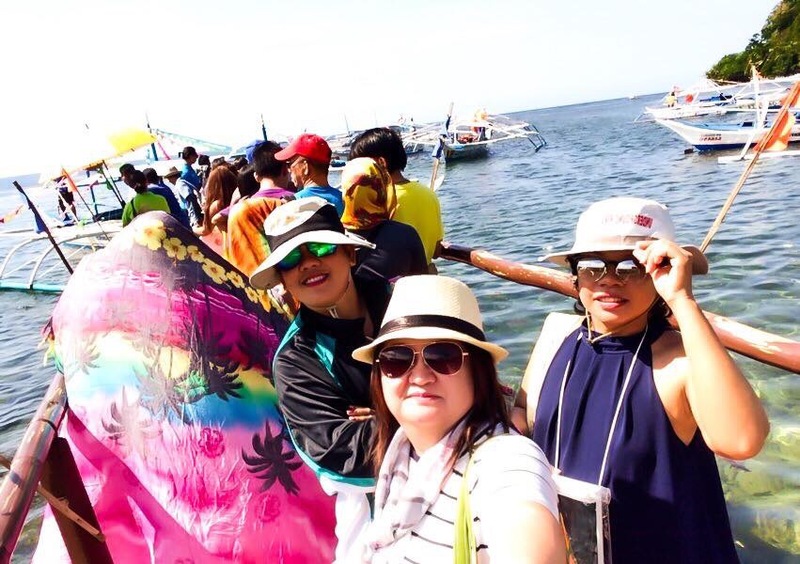 For foreign visitors, you can take an hour plane ride from Manila, the capital of the Philippines to Bacolod City and approximately, it will take 30-40 minutes shuttle ride to reach the resort. If you are staying in Bacolod City and using your own transportation, just follow the road going to Granada and on to Alangilan, you’ll be able to see the road signs pointing you towards the directions of Campuestohan. As soon as you see plenty of gamecock farms on either side of the road and feel the air getting cooler you are approaching nearer to the resort. 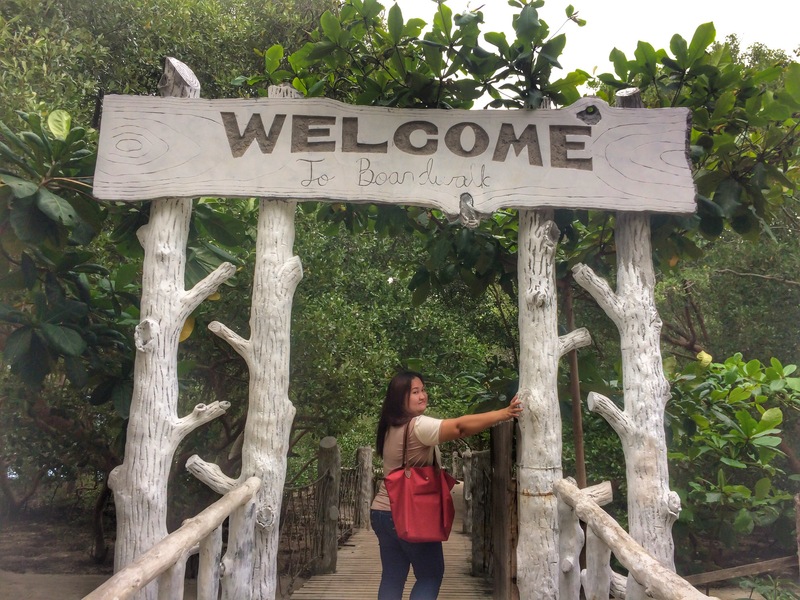 The moment you see a huge sign Campuestohan Highland Resort at the gate, you finally reach your destination. Prepare 150.00 pesos for the entrance fee except for children below two years old. Mobile: 09152111406 ; 09173005007; 09256008088 or visit their website by clicking this. Tips: If you plan to visit during peak season like summer vacation, it is best to book weeks ahead before the visit. 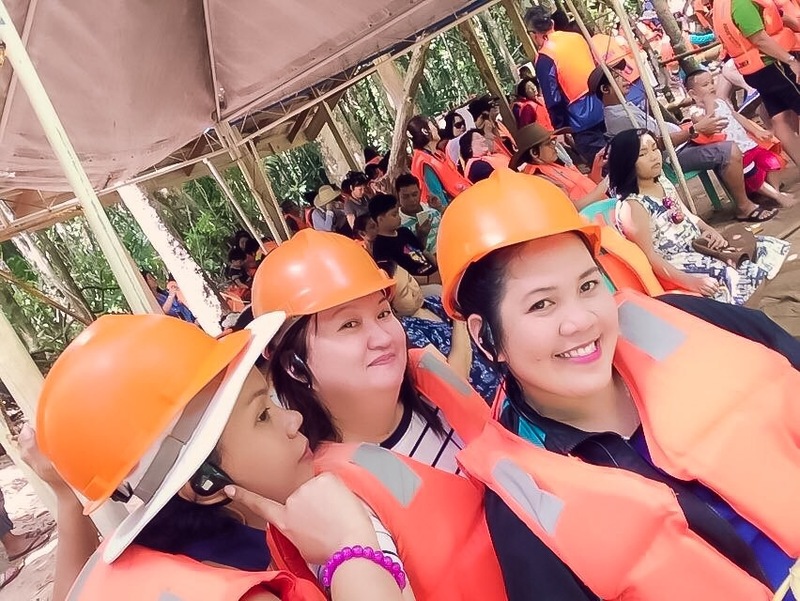 Special thanks to my friends who are teachers by profession and photographers by passion namely Glyndel D. Pastor, Miel Paculanang, Manette S. Fausto who gave me the blessing to use some of those amazing photos taken during the escapade. Salamat! Of course I will never forget how my friend and team kamalig comrade, Virginia Dupio who made us laugh most of the time especially when circumstances weren’t pleasing anymore. There’ll be no dull moments with her. Thank you guys for keeping me company. I am hoping to have more adventures with you in the coming days. Have fun as I always do everytime I get out of my shell to travel. Thanks for reading! Adios! I am a travel enthusiast. Once in a while, I leave and forget the worries of the world and take every opportunity that leads me to a place I have never been before. Yes, every day, for me is always a new day to explore, discover, and learn if we face it with an open mind. 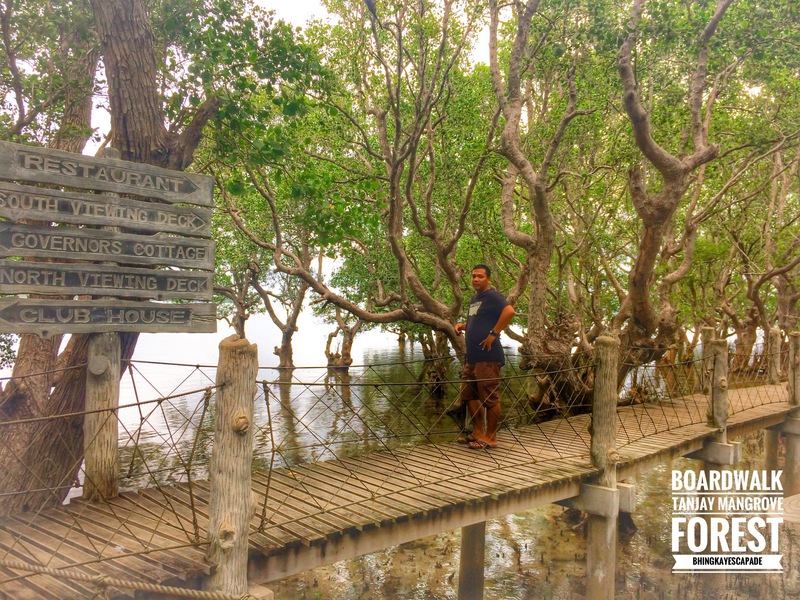 Visiting the Mangrove forest isn’t part of our plan and since we were already in Tanjay city to meet up with an online seller, its best to grab the opportunity to visit one of its pride, Boardwalk Mangrove Forest. An ordinary afternoon, surprisingly, turned out to be a breezy Friday afternoon chill with my husband at the boardwalk. Had so much fun strolling, sight seeing and picture taking. 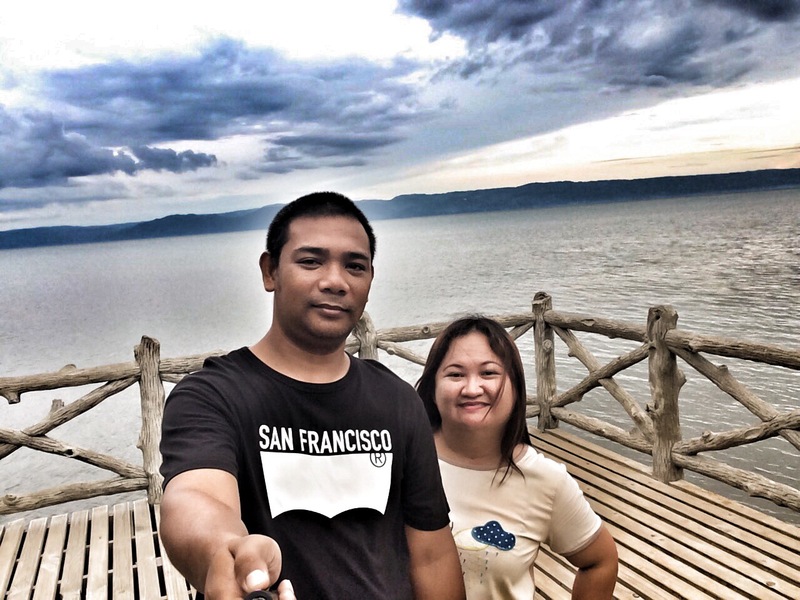 I am so happy because this guy who prefers to stay home and lost himself with his addictive online games, suddenly, became my travel buddy lately. It was indeed an adventure-filled afternoon for there were no enough signs along the road with so many crossroads to choose from. But by using our hearts as our compass, we have reached our destinations. 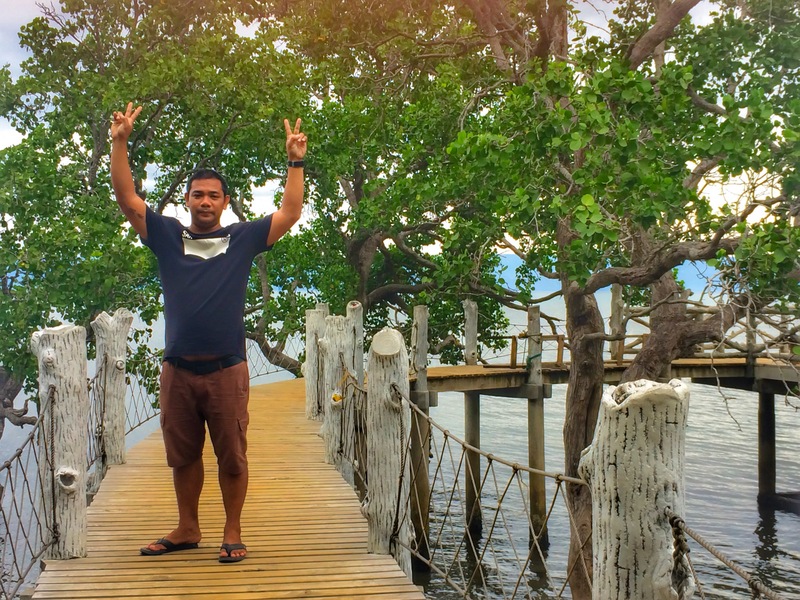 It was a long drive from the city to a secluded place in San Isidro, Tabuc, Tanjay city where the famous Boardwalk is found. Yet, it was all worth the trip. I have found tranquility and serenity in the place. 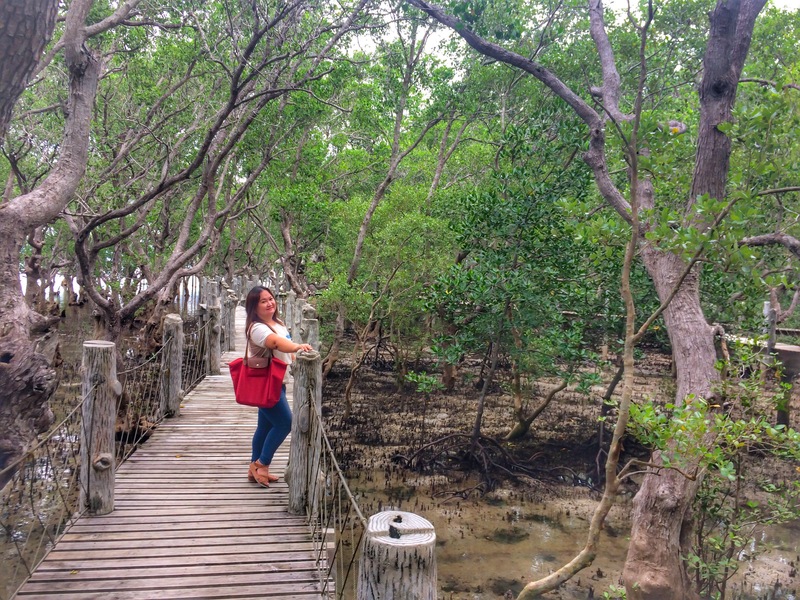 The chirping sound of the birds I heard and the mangrove leaves dancing with the breeze plus the soothing and refreshing smell of salty sea air is somehow therapeutic and calming. 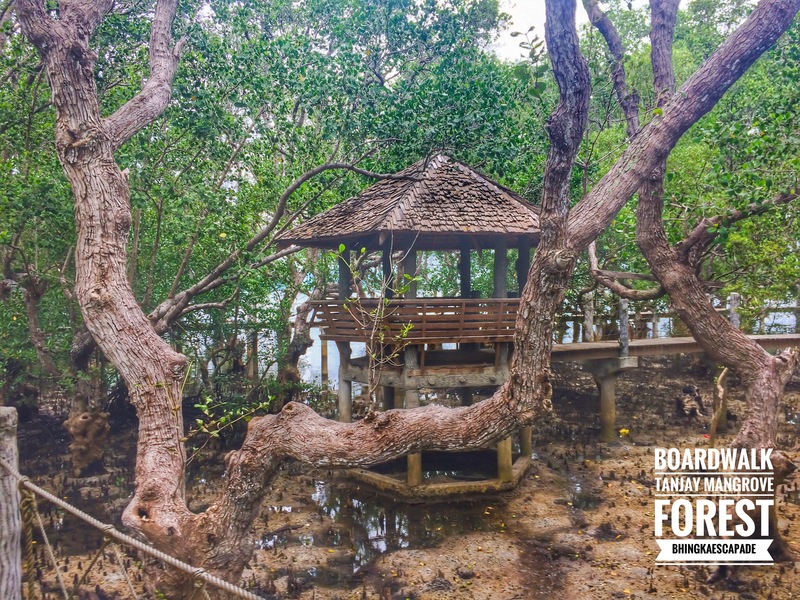 With its beautiful sea scape, such a perfect place for photoshoots and for family picnic on weekends or holidays. It has viewing decks where you can witness the sun amazingly shines in the morning. Amazing, isn’t it? An afternoon we would never forget. At last, we, finally, found the opportunity to take a break from life’s daily grind and make memories worth reminiscing and keeping. 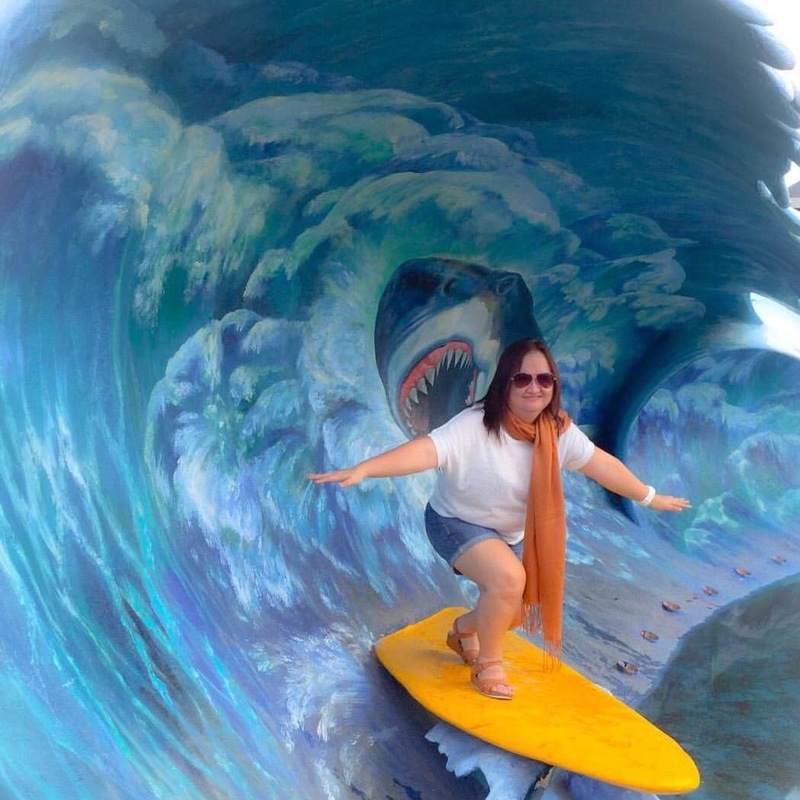 Here are some of the pictures I and my husband took during our short but exciting adventure at the Boardwalk. 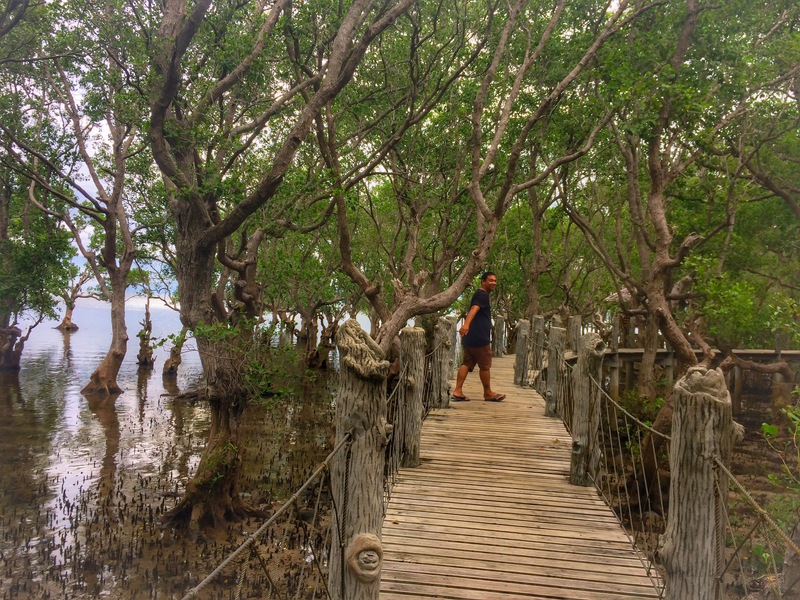 Boardwalk Mangrove Forest is located at San Isidro, Tabuc, Tanjay City. Tanjay City is a fourth class city and part of the 2nd Congressional District in the province of Negros Oriental, Philippines. 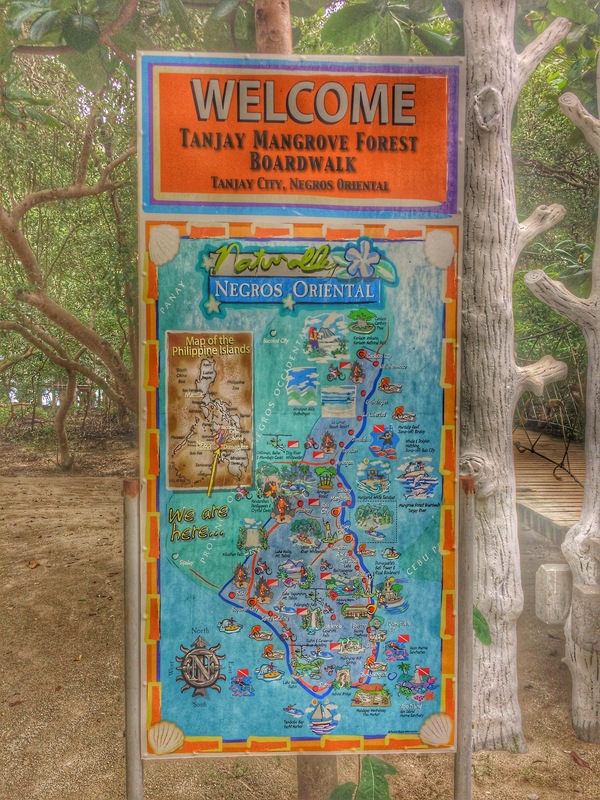 It is located 30 kilometers north of Dumaguete City, the gateway to the famous Tanjay Boardwalk. From Dumagute city, one can either commute by bus or van to reach Tanjay City. Ask the driver to drop you at the bus stop where you can take pedicabs that can take you at the site. But, renting a car and hiring a trusted driver is safer for foreigners than taking pedicab in a very secluded place. No entrance fee. Any generous amount you can give perhaps for the maintenance won’t cost a fortune. Humans, as we are, must face the practical realities of life: its opportunities; its defeats and its successes; how we face and handle these circumstances either we choose to become masters or victims of circumstances depend upon our dispositions, perspectives and values that would help us cope with these. It is always a matter of choice. As they say, happiness is always a choice. So I always choose to be happy despite life’s inevitable struggles and challenges. Today, I am celebrating the most precious gift that God has blessed me with-life. I thank him for another year he has given me. I opt to keep the celebration simple with my husband, children, my father, brother and few cousins. I also thank God for the gift of family, friends, and work, yet, most of all, I thank him for his love who has saved me from sins. Yes, I am saved by grace. Hurray! Isn’t it worth celebrating? My worst selfie ever. This was taken two days after I had my major thyroid operation. Thanking God for the fast recovery. I thank him also for granting me a second life and for sparing me from the wrath of cancer. It was last October 22, 2016, when I had my thyroidectomy due to a cyst growing on my right thyroid which caused me to suffer dyspnea. I would never forget how my endocrinologist warned me about my situation for she would not want to give me a false hope. This is what she said which is still fresh on my memory ti’ll this very moment, ” it is 85 % cancerous based on what I have seen on your ultrasound but God is great and believe in the power of prayers,” leaving me choked for a while. Now I understand how it feels to have a relative who suffered cancer and I will tell you it isn’t as simple and easy as it seemed to be. Imagining your days numbered and thinking on ways how to spend the remaining days worth remembering… is quite disappointing. Yes, I have reached to a point where I have questioned God. But, I am certain and hopeful that whatever trials He has given me it would surely come to end. I know God won’t give me problems I could not bear. Praise the Lord I am blessed, it was negative. My family and I were so happy knowing I am cancer free. It was indeed an answered prayer. If not with prayers and faith perhaps I would not be able to celebrate my 37th year with my family and loved ones today. One thing I learned that no matter how upsetting and disappointing the situation can be kneel down and pray, entrust everything to God and he will direct your path. Yes, I have so much to be thankful for: my parents who never left my side during tough times; my husband who is always there to give me a lift when I was down and weary; and my kids who became a source of inspiration. It is also comforting to know that the love and support of friends and relatives is nearby. It is indeed a celebration of love and life. Praise the Lord! This I say I am blessed! Thank you Lord! Your grace is sufficient for me! Temple of Leah was built as a symbol of undying love and ceaseless devotion of a husband named Teodorico Adarna to his beautiful wife, Leah Adarna who died of a cancer. 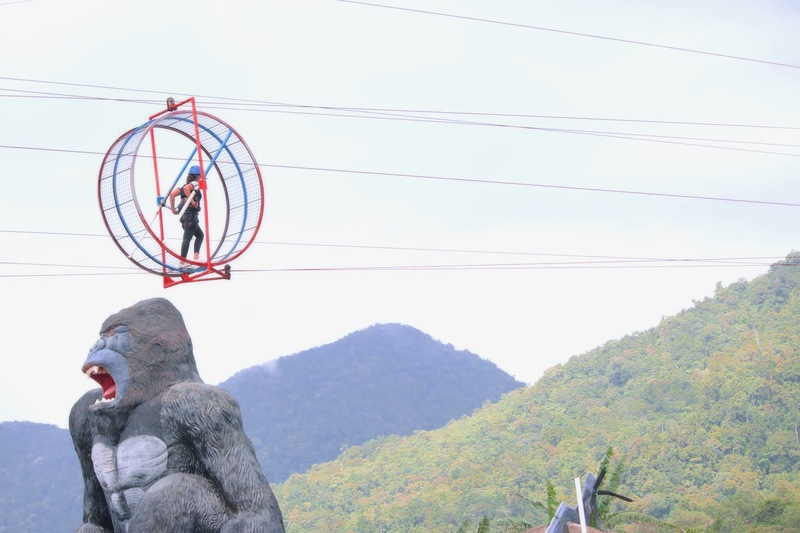 It is situated on a hilltop of Barangay Busay overlooking the queen city of the south, Cebu city. It has become one of the tourist destinations in the city because of its breathtaking view which is ideal for photoshoots. 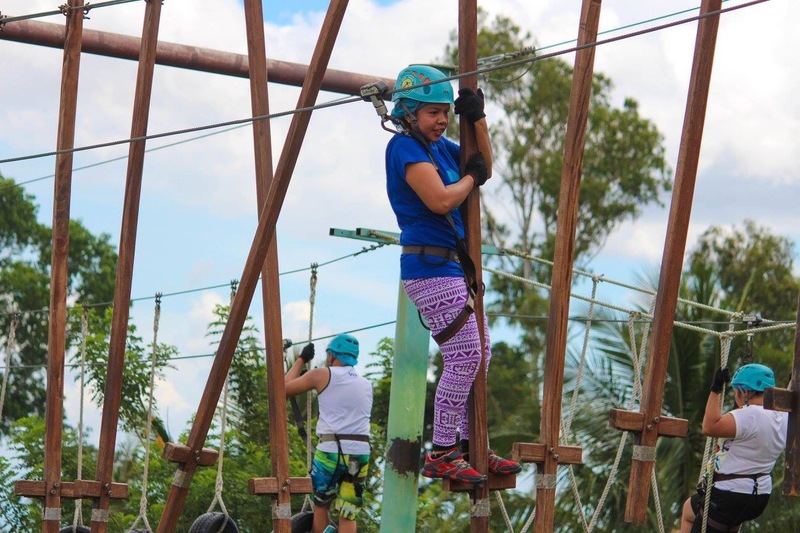 It has an entrance fee of fifty pesos which is very affordable for everybody. I felt like I was in Rome. Here are some of the pictures we took during our visit. When you pass by at Pulang Bato, Valencia road, Negros Oriental you’ll get to smell the sulfuric fumes and see the cloud-like steam coming from the mountain cracks. 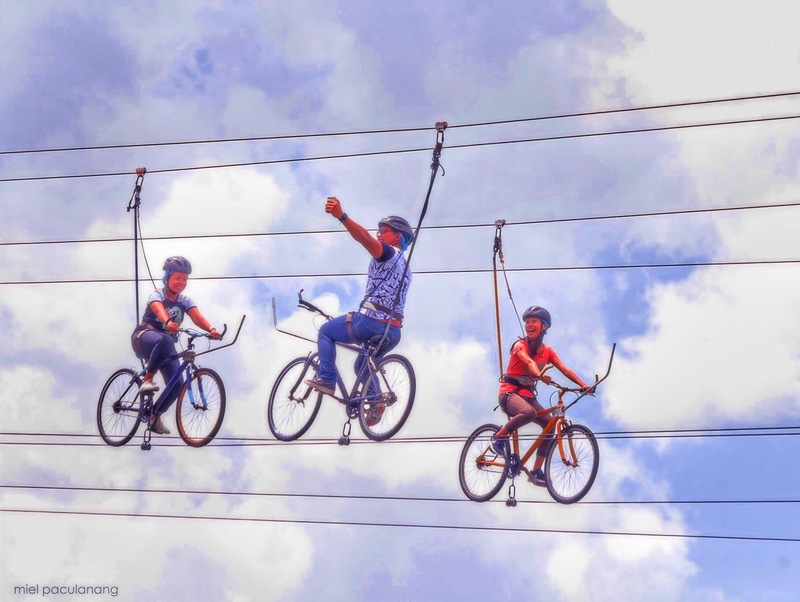 It is less than an hour ride from the city of Dumaguete. Today, it has become one of the tourist’s destinations in the province. new post. I’m a public senior high school teacher. Yes, I love teaching. Nothing is more fulfilling than watching your students succeed in all facets of life. Yet, it is not an easy task. It is indeed frustrating and drudging at times. I went home running out of energy, emotionally drained, and physically exhausted. I spent my nights sleepless with those routinely tasks such as planning lessons, preparing quizzes, and checking students’ papers. Oftentimes, I found myself falling asleep with students’ papers as my pillow. All these things, lately, became a predator that stalked my precious time. Then, I realized when I looked at myself in the mirror and noticed that I am getting old quickly, perhaps, because I rarely find time pampering myself in beauty salons which I used to; socializing and hanging out with friends; and going out for a picnic with my family because of my hectic schedule. This famous cliche , “All work and no play makes Jack a dull boy” is somehow true. It suddenly reminded me to do something more exciting, adventurous and worthwhile while there is still time. So, without hesitation I took the biggest break, so far, my first escapade which enkindled my passion for travel. 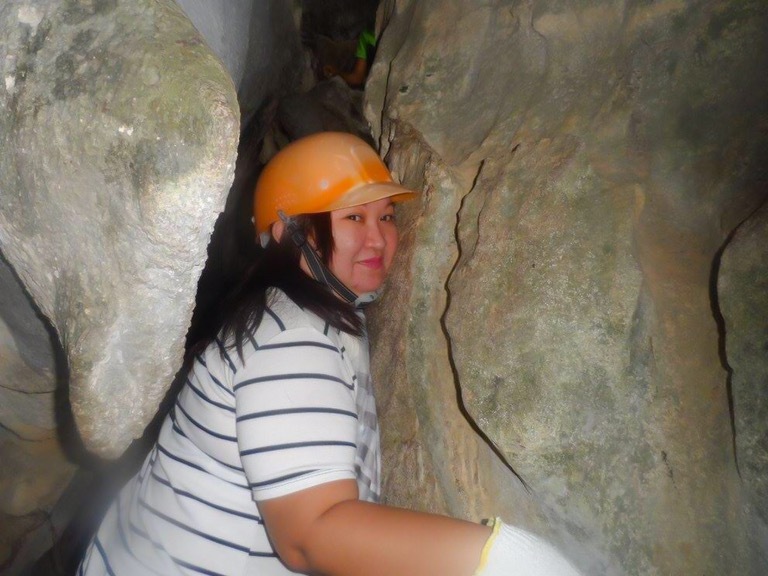 Because we wanted an adventure packed summer escapade, I did a research and bingo, Palawan is the best place to go. 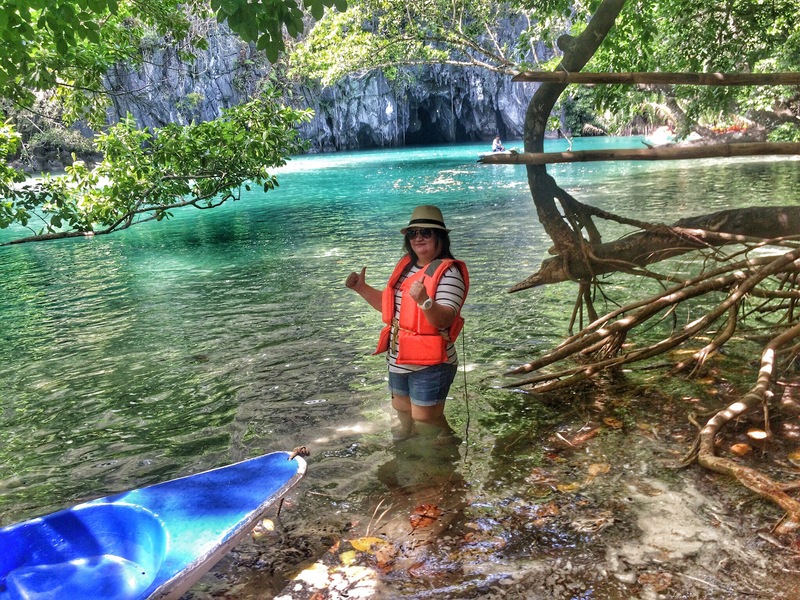 But wait, we hadn’t decided it yet, Coron, El Nido, or Puerto Princesa? Which is which? 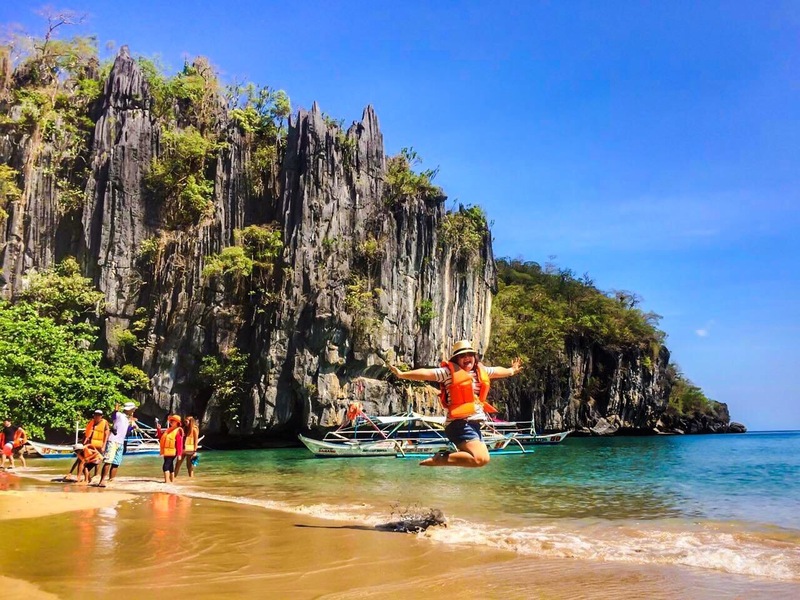 After researching and finding out about Palawan dubbed as the Best Island in the World, it was quite confusing which place to go and visit first given the limited time. 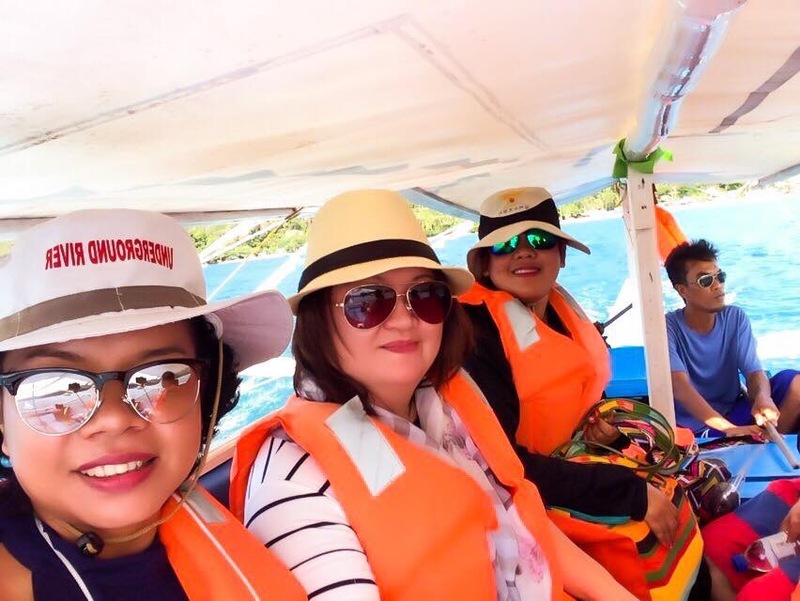 I love to visit and dive Coron’s lagoons full of crytal waters, one loves to witness the breathtaking beauty of El Nido and its pristine and white sand beaches, and the other one loves to experience extreme adventures. Huh! 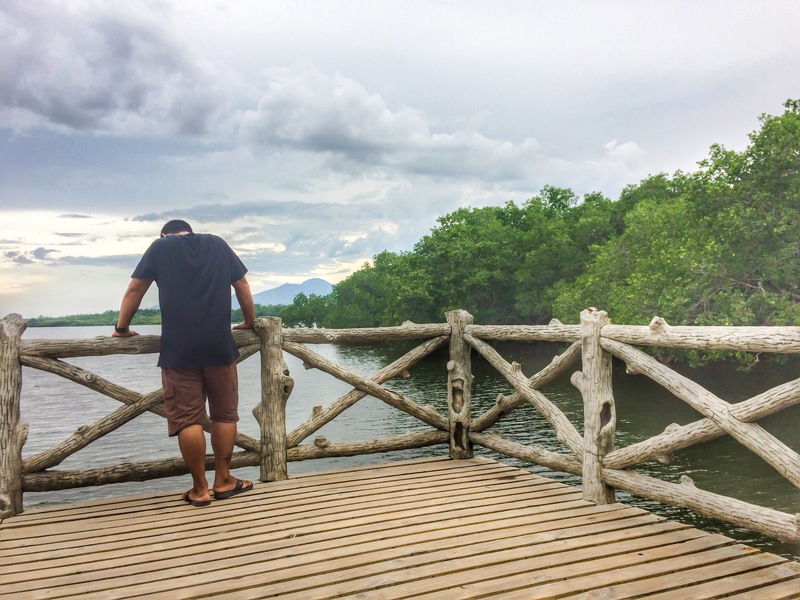 Yet, after staggering momentarily, we decided to visit Puerto Princesa. We arrived at the city around 6 in the morning and were picked up by our official tour van 30 minutes after our arrival and dropped us at our hotel to take a rest before heading the city tour after lunch. The long wait really pissed me off yet, it has been said that the best way to enjoy life is to realize that we are not always in control of everything. Our city tour started with a running tour at the Baywalk. It was lovely and scenic but I do not have exciting stories to share except from what I have learned from our tour guide that the place was once a squatter area. Then, a fire swallowed the houses and after the incident, the residents weren’t allowed to build houses. The local government turned it to one of the city’s tourist destination. It was just a glimpse through our car windows as we headed fast to our second stop at Plaza Cuartel. 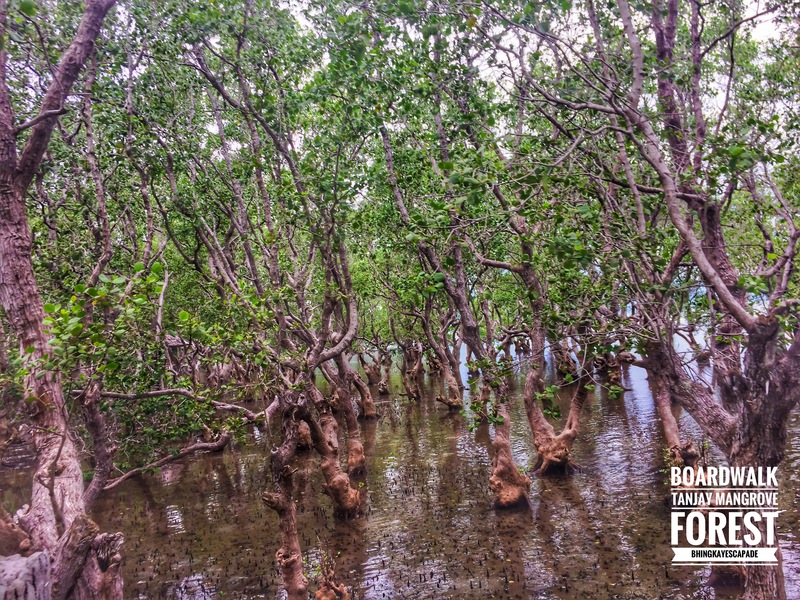 Puerto Princesa is not only a paradise for locals and tourists, but it has a historical significance as well. Be ready to hear its dark history that would bring you to tears. 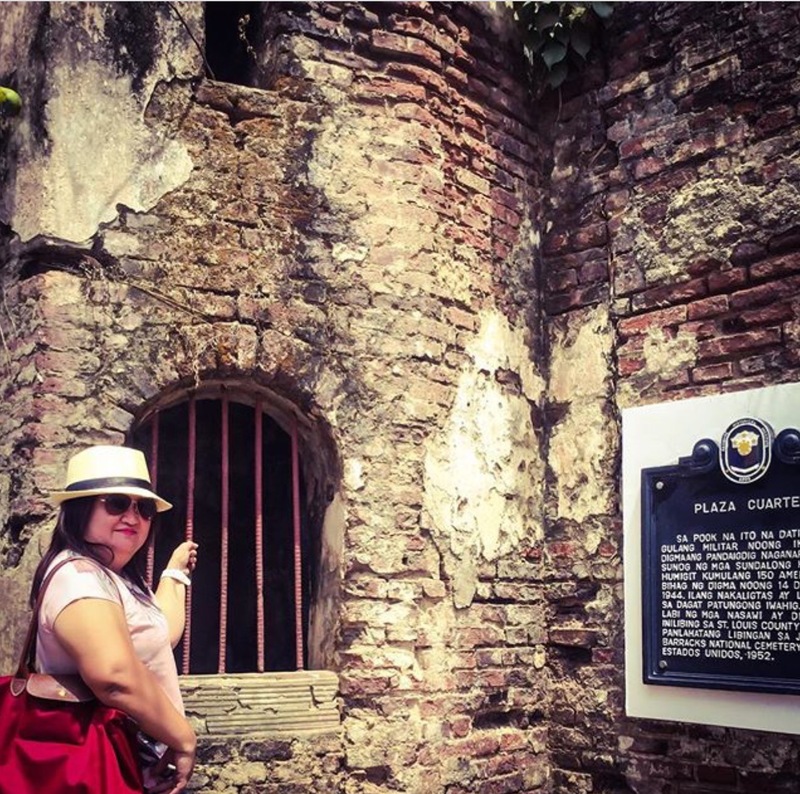 Before Plaza Cuartel became a leisure park, it was a garrison of Spaniards during the World War II where the burning of more or less 150 American Prisoners of War by the Japanese soldiers took place on December 14, 1944. 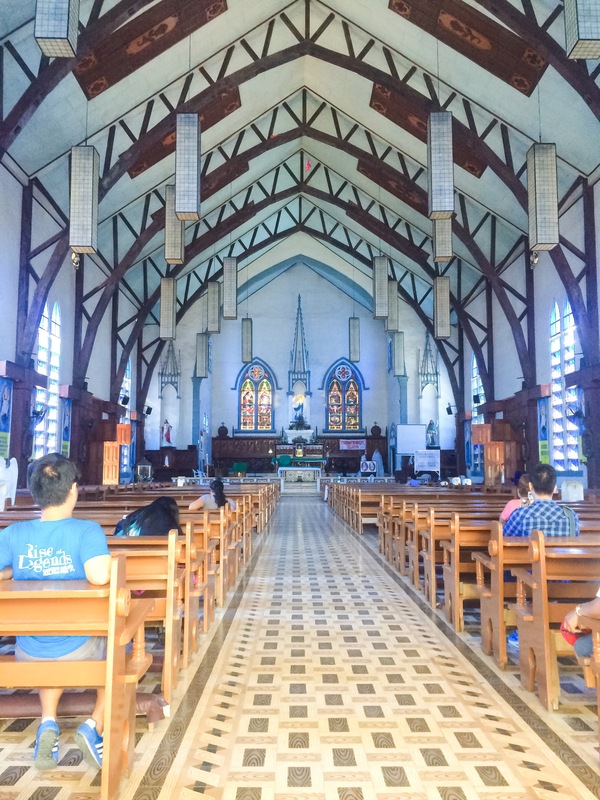 Adjacent to the park, is another famous tourist destination, the Immaculate Conception Cathedral which according to our tour guide stands as the central church of the island. Its beautiful blue-colored facade is admirably fascinating. I went inside not to light candles or do stuff Catholics used to do (well……..not for a Protestant like me) during their church visit but took some great snaps of this wonderful work of architecture. 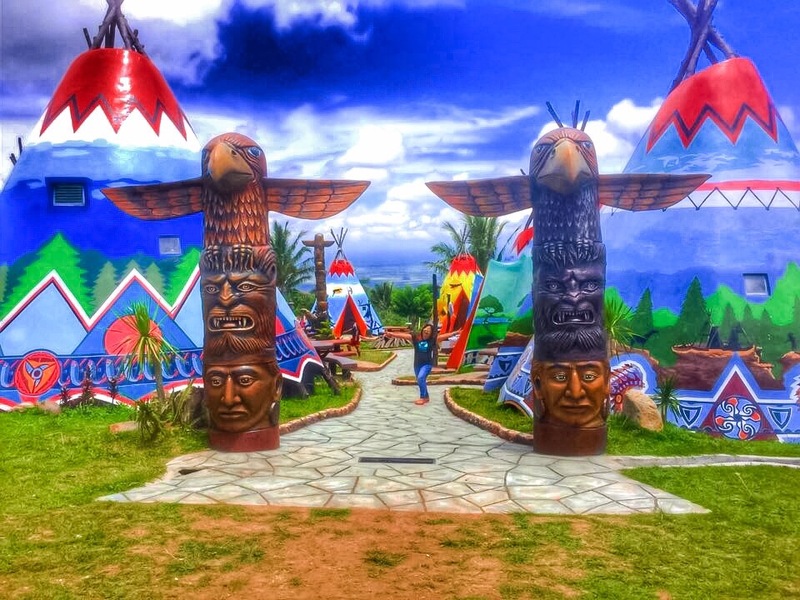 Our next stop was at the Butterfly Garden and Tribal village located at Sta. Monica, Puerto Princesa. 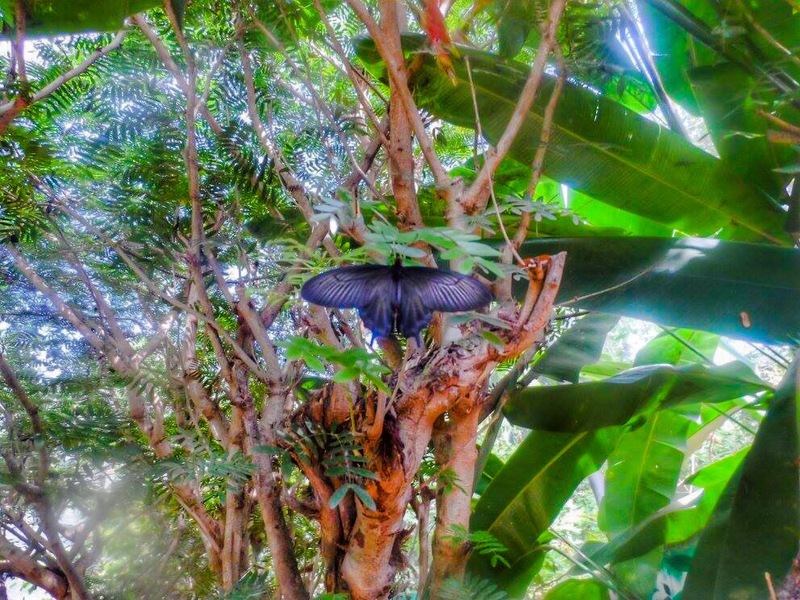 It is where the mesmerizing butterflies in Southeast Asia are cultured and preserved. A beautiful sanctuary of variety of butterfly species, insects, and flowering plants. Its showcase of variety of species of the Class Insecta which includes the arthropods goes to prove that Palawan, the last frontier of the Philippines is indeed true. 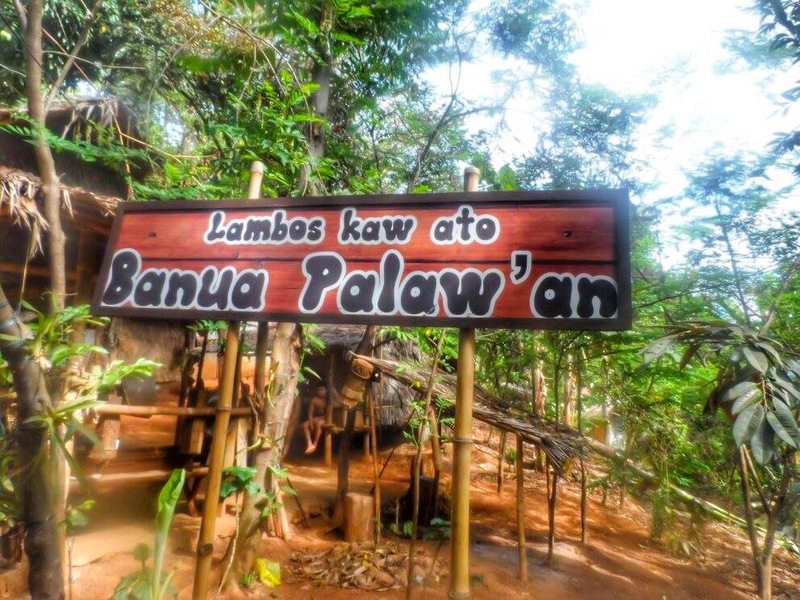 We have also visited the tribal village where we had the chance to meet the members of the Palaw’an tribe, one of the many indigenous people of Palawan. We learned about their culture which includes their way of hunting food and starting a fire without using matches. It was worth the visit. It was educational. Lucky enough to have visited Congressman Ramon Mitra’s old residence which became one of the tourist’s destinations in the city. 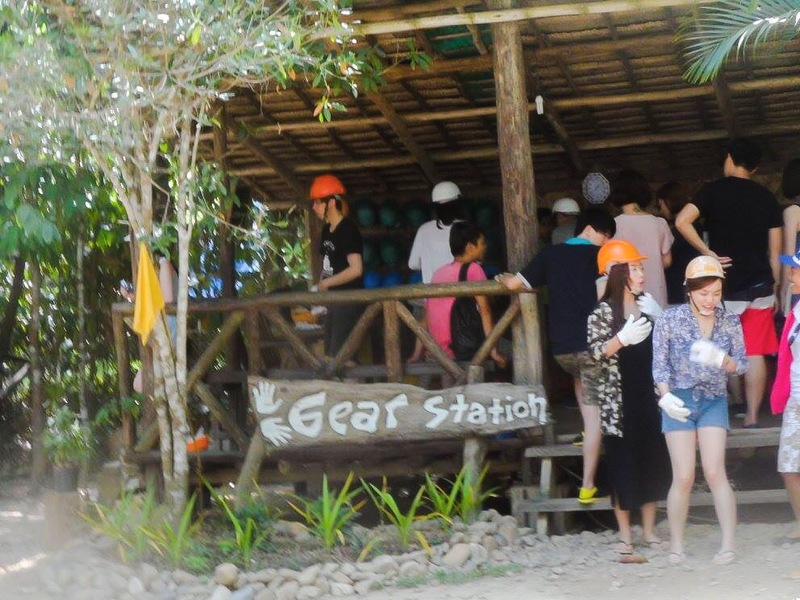 It is situated on a hilltop of Puerto Princesa overlooking the alluring view of Honday Bay. It is the perfect place for people seeking for serenity and refuge with nature after all the tiresome routinely tasks at the workplace. Such, an ideal place to relax, unwind and meditate with family, friends and loved ones. Sad, we hadn’t tried horse riding which is available at the ranch for it was just a quick stop because we’re running out of time to visit other places in the city for our half day city tour. 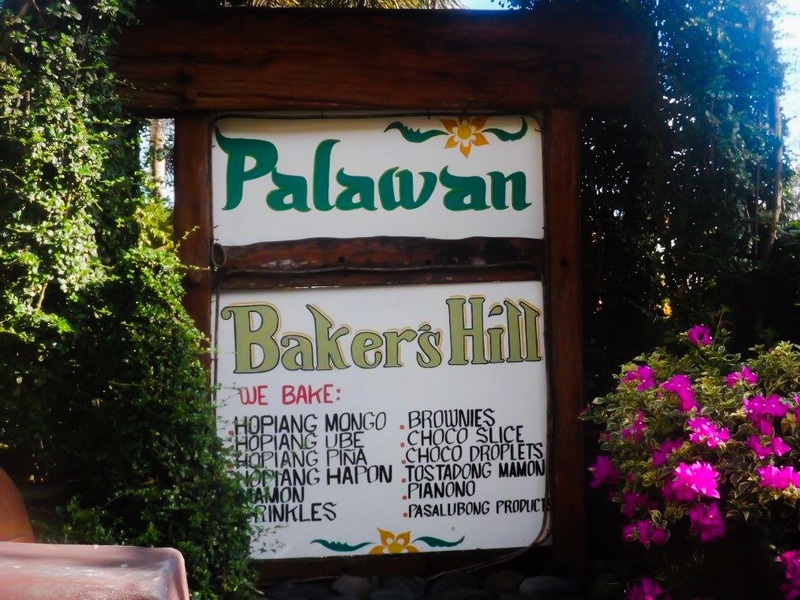 Our city tour’s final stop was at the famous Disney-themed park, adults and kids will surely love, Baker’s Hill. 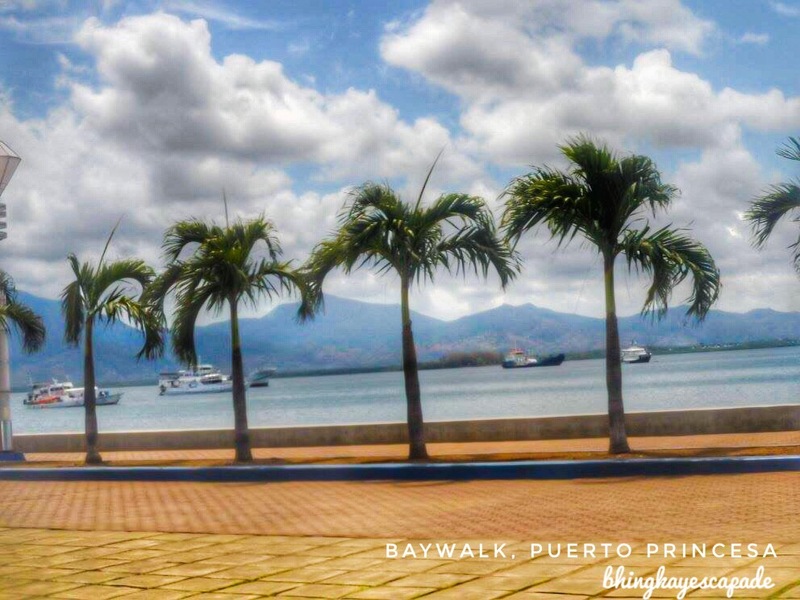 No wonder why it became one of the famous places in Puerto Princesa where visitors always keep coming back. This place is awesome; it has a lot to offer. 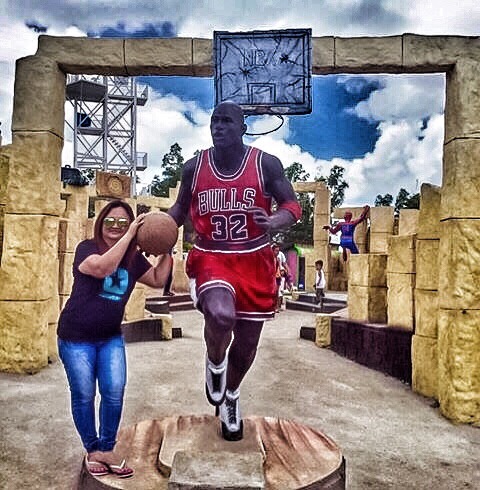 Aside from being the home of Shrek, Fiona and other human-sized Disney character statues; it also has a playground where children could have a lot of fun; beautiful landscapes and gardens making it a perfect place for selfies and groupies; a mini zoo where you can see a beautiful peacock proudly struts his colorful plumage, and other few animals; most of all, it sells freshly baked bread and goodies, chocolate crinkles and its best seller, my favorite ube-flavored hopia, the most delicious hopia I have ever tasted so far, such are perfect for pasalubong! These human sized Disney character statues are found inside the Baker’s Hill. My toes were aching after the strolling, sight-seeing and picture taking so we rested for a while, refreshed ourselves with their fresh fruit juice, and appeased our tummy with yummy baked goodies and flavored hopia which offered for free by our tour guide then headed back to the hotel to get enough rest for another adventure the next day. 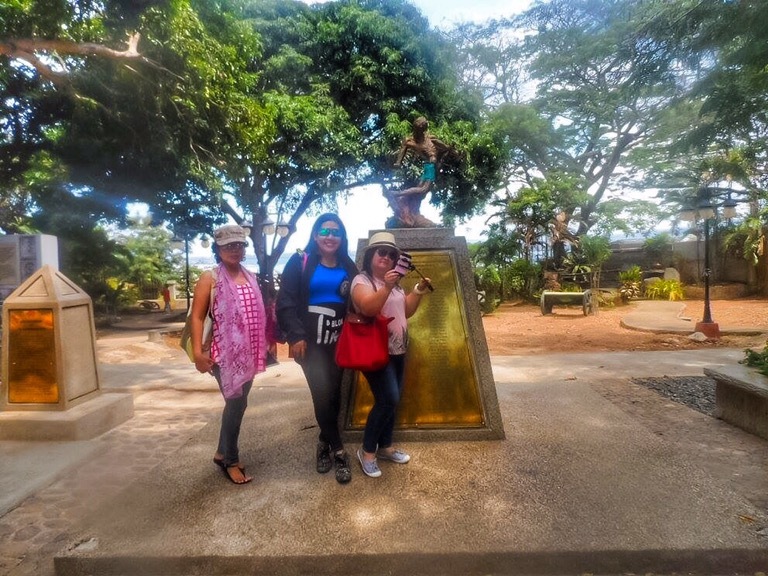 WIth our tour guide for the day who treated us with yummy hopia. This place is a must-visit. Don’t miss dropping by. Though I did not get enough sleep on the first night due to over excitement still the show went on. The sun was up, yipee, time for another exciting adventure. The moment we’ve all been waiting for. 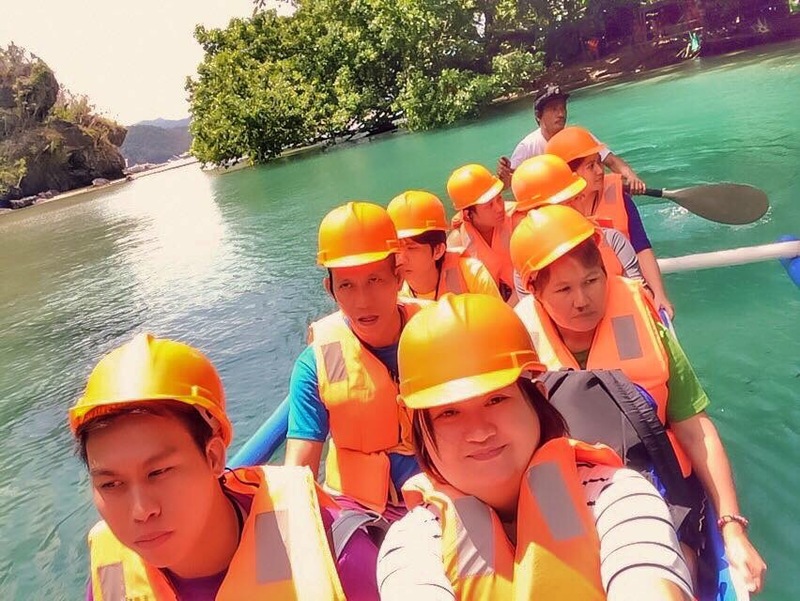 Angela, our enthusiastic tour guide of the day, picked us up at the hotel and together with other tourists, we took the 80-kilometer ride from the city to Sabang, the gateway of the famous Underground River. 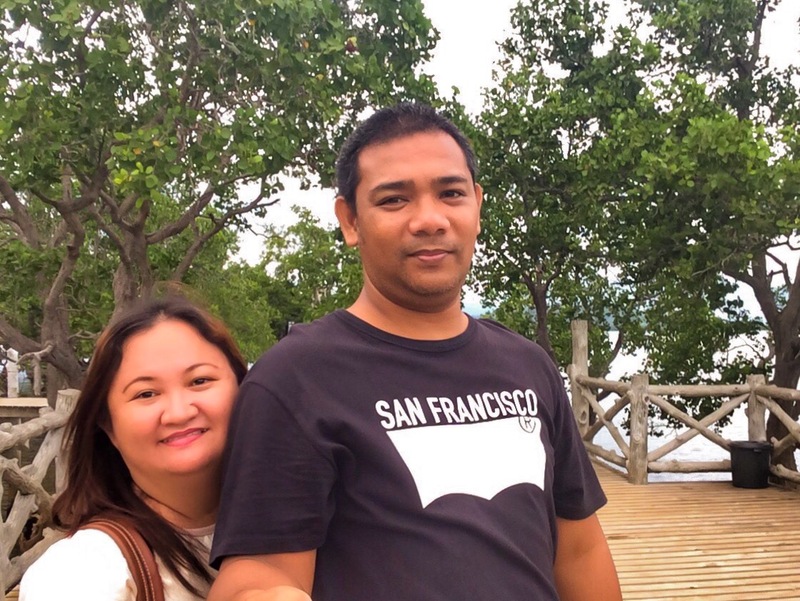 The sun was excruciatingly hot when we arrived at Sabang wharf. 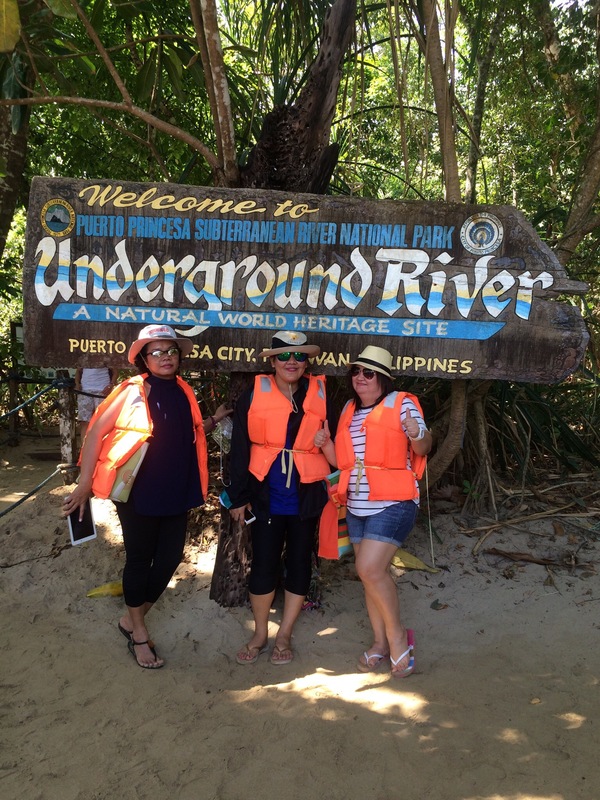 We waited for half an hour until, we finally, took more or less, a 20-minute boat ride to the underground river park. It was summer and a peak season so as expected there were lots of tourists at the site. So we waited for another long hours since it was a first come first serve basis. 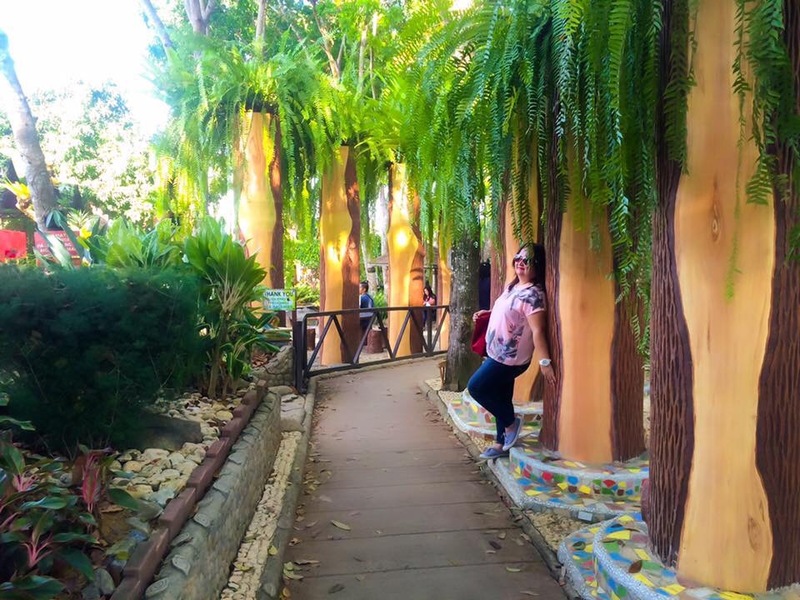 While Angela was busy settling our bills (environment and entrance fees), we strolled around the mini forest and took some few great snaps. The place is perfectly awesome that one could hardly resist but capture its stunning views. Good things come to those who wait. 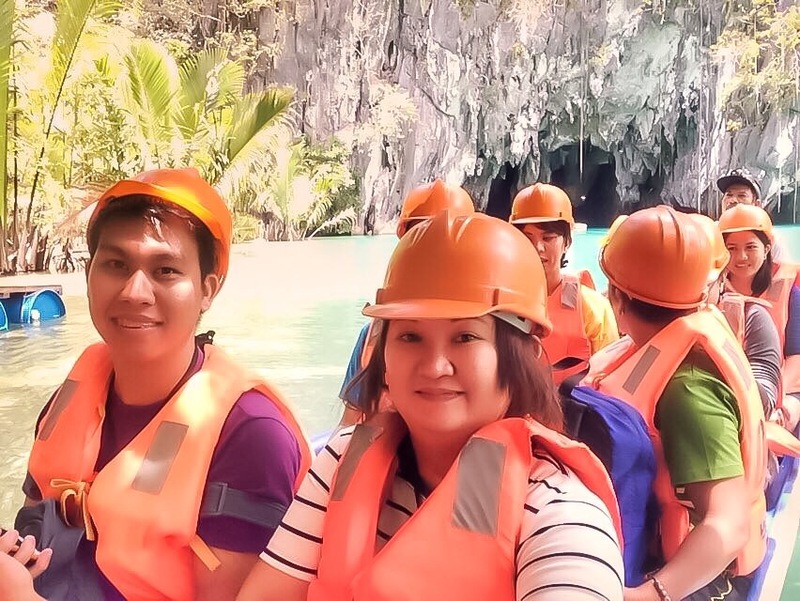 Atlast, it came and it was our turn to take the 45-minute paddled boat ride inside the cave. 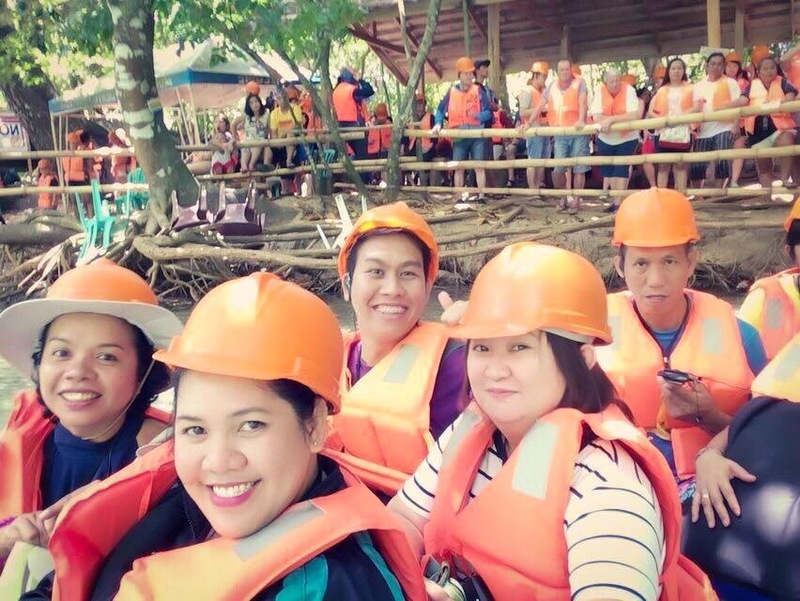 Life jackets and helmets were given by the staffs. To prevent noise inside the cave, we were given headsets in which we could hear a recorded voice giving informations and telling stories about the site. I almost could not believe that I was already at one of my dream destinations. I thought I was only watching Discovery or National Geographic Channel because I thought I would only witness it on television but praise God it’s for real this time. I was gliding through a canoe on its ways to the underground river. Dream came true. Wow just wow. It was an experience I would never forget. 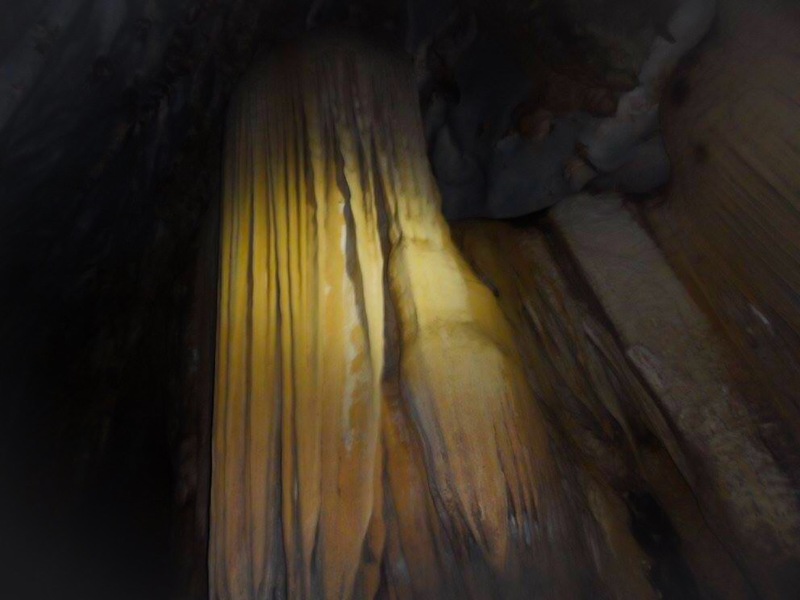 Seeing those amazingly formed stalagmites and stalactites made me realize how blessed I am to have witnessed God’s wonderful creation, a testament of his love. 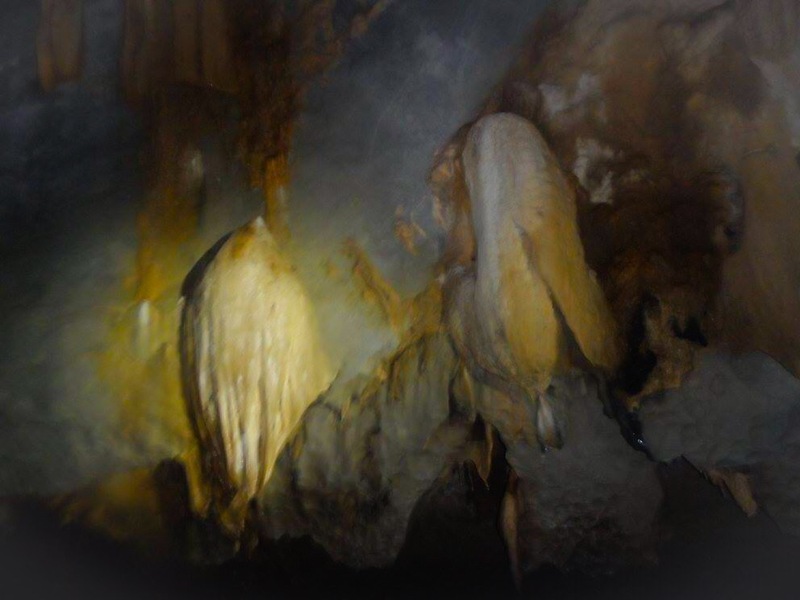 Inside the cave, we have visited a supermarket where we have seen a formed stalactite resembling image of a fried eggplant; we have also passed by a titanic ship formed stalagmite; a huge opera stage; a cathedral and most of all we have seen P-noy’s tuwid na daan where our tour ended as it was the prohibited area. How great thou art, oh Lord! After that exceptional ride experience at the underground river, we headed back to Sabang wharf where a sumptuous meal was served. 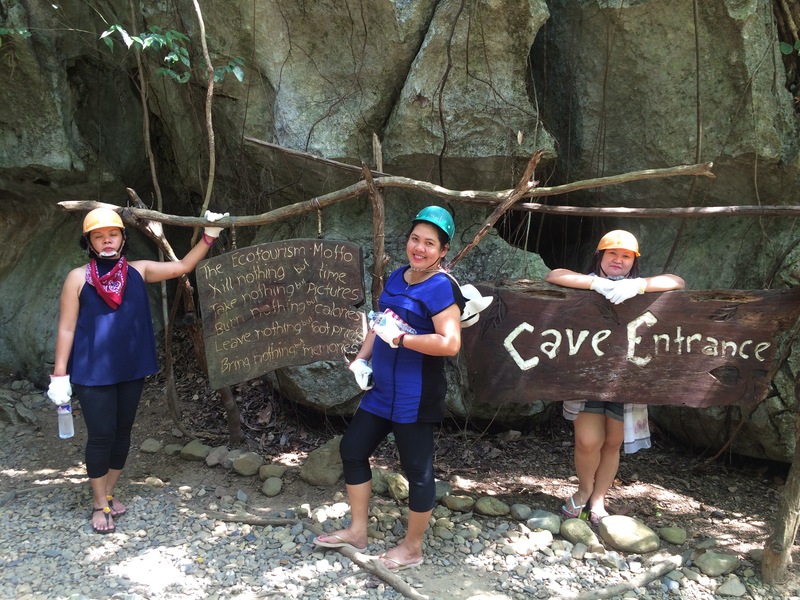 After we took our lunch at one of the restaurants in Sabang wharf, we headed our way back and had a quick stop over at the Elephant Karst mountain as it was not part of our tour package. Thanks to Angel, our friendly tour guide for giving us time and allowing us to document another God’s fantastic creation. 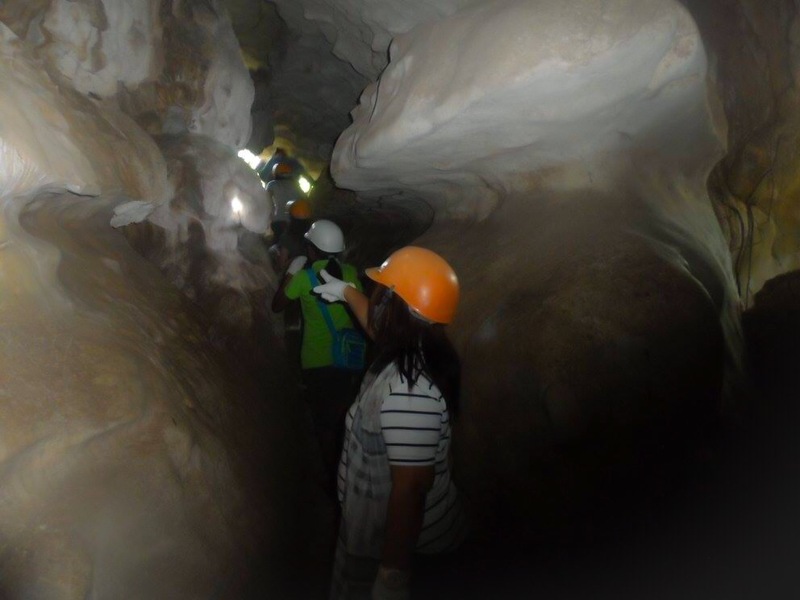 Elephant Karst mountain became famous when seen in the popular reality tv show, The Amazing Race Philippines. 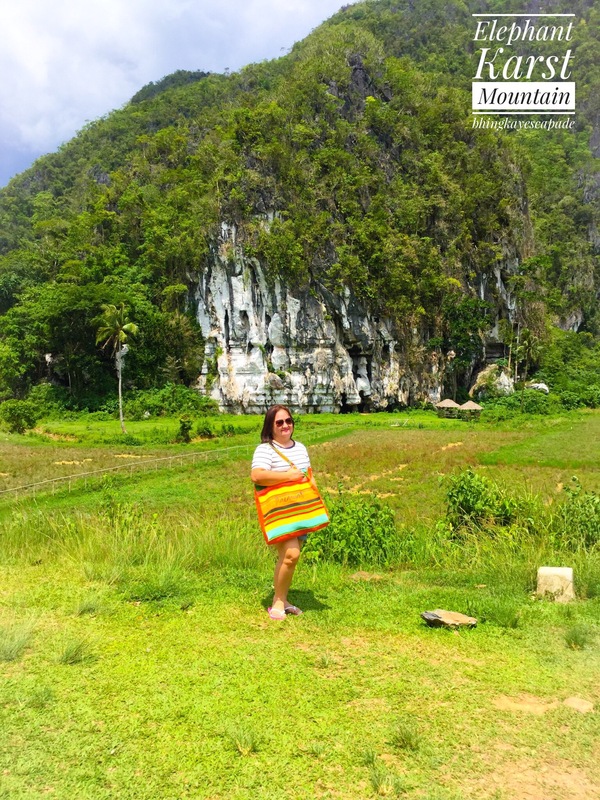 I couldn’t help but pose with this beautiful landscape: mountain and cliff of limestone resembling elephant face plus the scenic rice field, amazing isn’t it? Then, headed to our next destination. 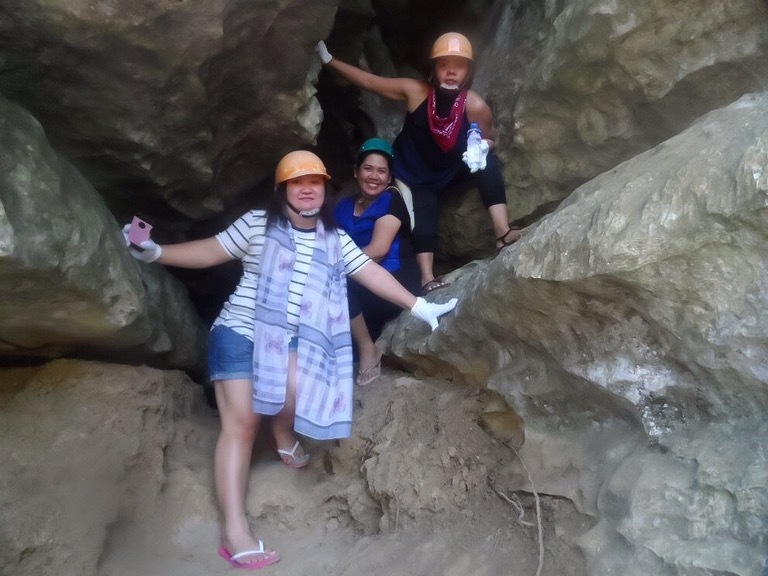 Before heading back to the city, we dropped by at Ugong Rock at Barangay Tagabinet, Puerto Princesa for another, this time, an ultimate adventure of exhilarating and eye-popping activities such as caving, spelunking and zip-lining. 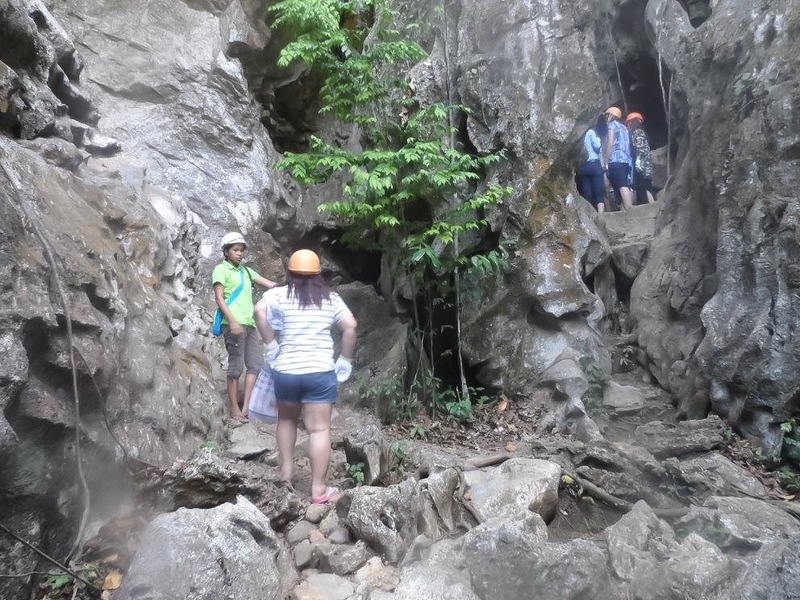 In the middle of rice fields and karst mountains stands a 75 feet-high limestone formation known as Ugong rock. 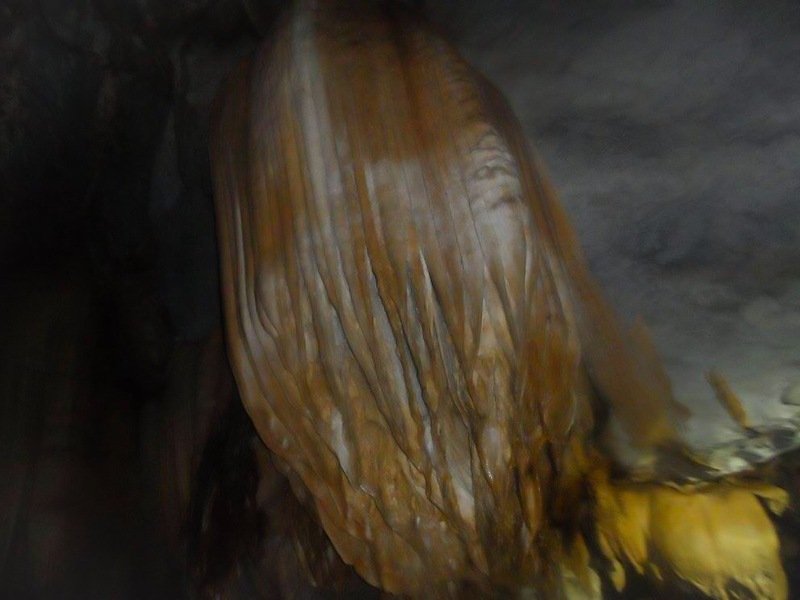 “Ugong” which means reverberating sounds produced when limestones inside the cave hit with a palm. 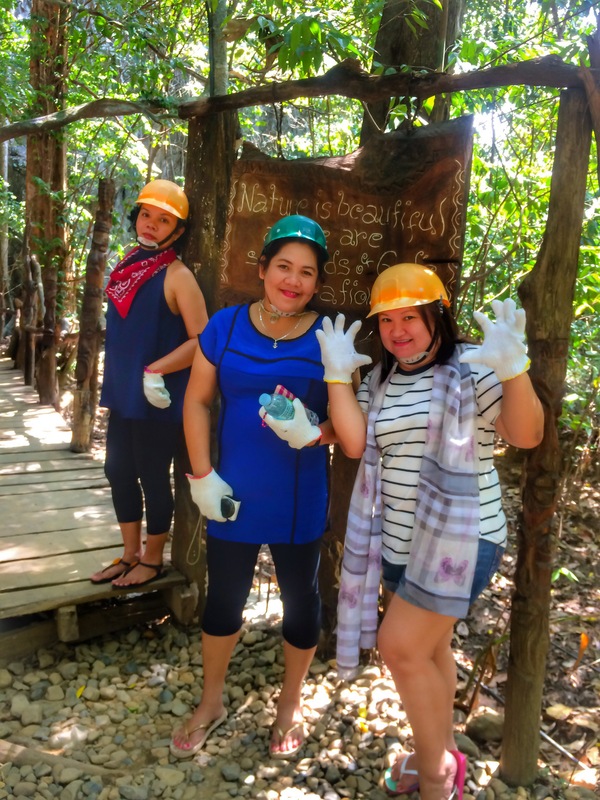 It is a community based tourism project initiated by ABS CBN Foundation Bantay Kalikasan and in partnership with the local government of Puerto Princesa giving the locals the means of earning a living. Visitors are welcomed by the friendly locals and are accommodated at the reception area where orientation, instructions, precautions and the like are given. After watching the video, paying our dues and suited the helmet and gloves, we headed to the cave’s entrance to start the adventure. 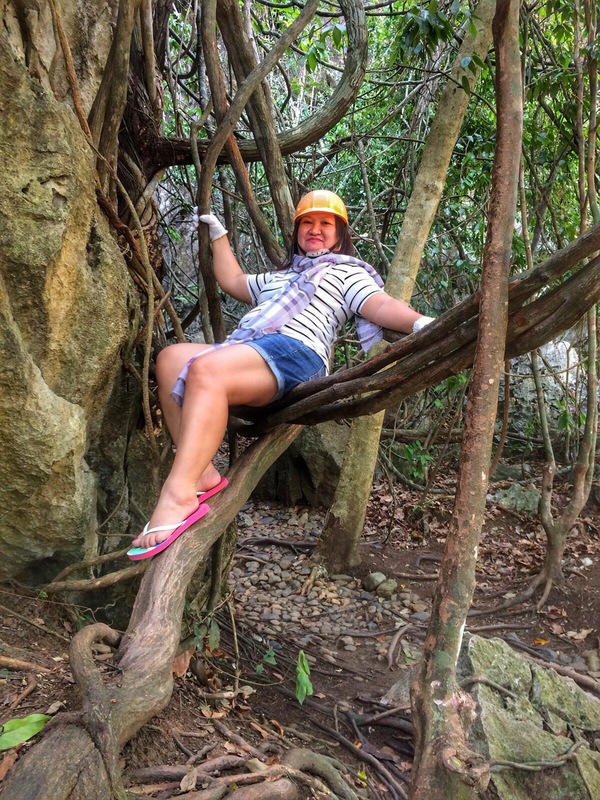 Almost out of breath, she took a rest at the strongest vine and pretended like Jane waiting for Tarzan to pick her up. Poor Jane Tarzan didn’t show up. 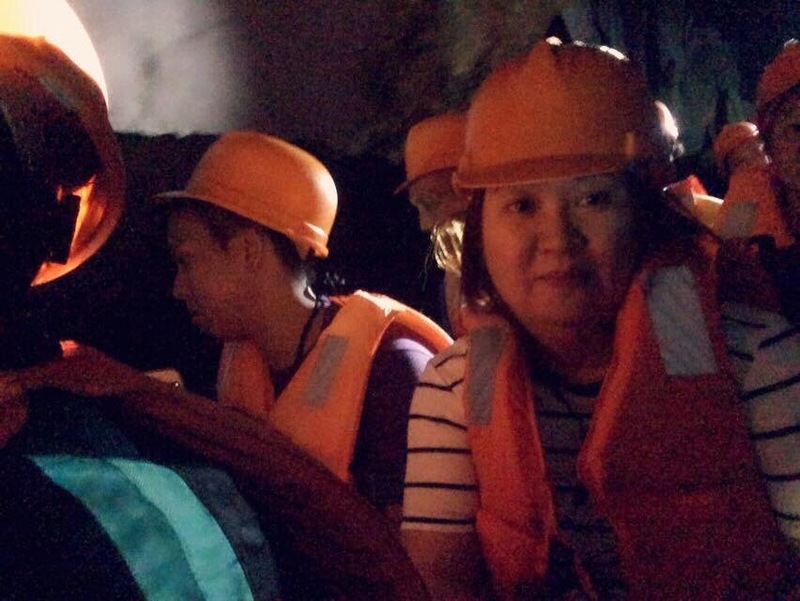 Good thing we wore helmets as protection from hitting our heads on the hard rock every time we passed througn a very narrow passage. It was indeed an unforgettable experience. We climbed through steep rocks; passed through some narrow passageways; took the man made-wooden bridge inside; and took the wooden ladder. Alas, we’re almost halfway to the summit. We have reached at what the locals called the spelunking area which I considered to be the most challenging part of the adventure in which one would take about 12 feet climb at a steep slope requiring enough strength and balance. I was hesitant at first, considering my weight I thought I couldn’t make it. 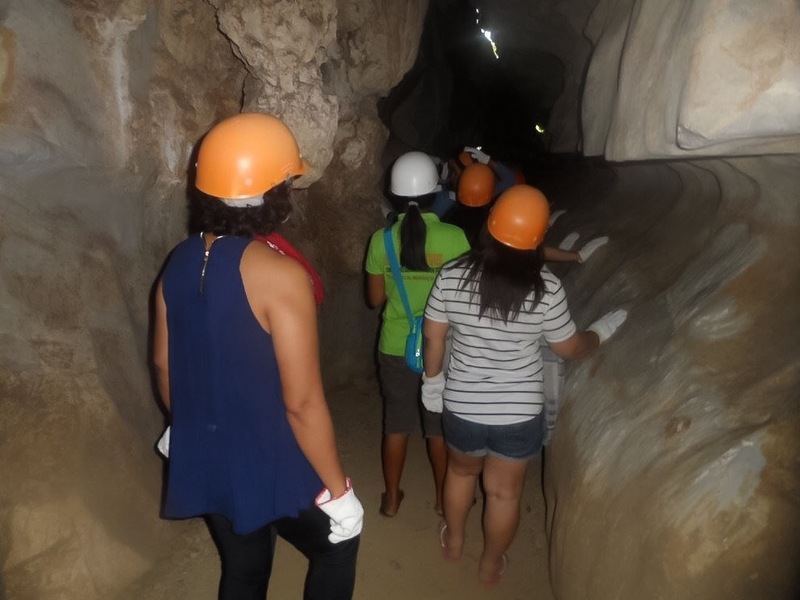 But looking how fearless and determined my fellow teachers were and seeing how the staffs have assisted every step, I finally have given myself a try. I love to call it self-discovery of some sorts. We continued and passed through another narrow passageways then took another but shorter wooden stairs leading its way to the top of the mountain. 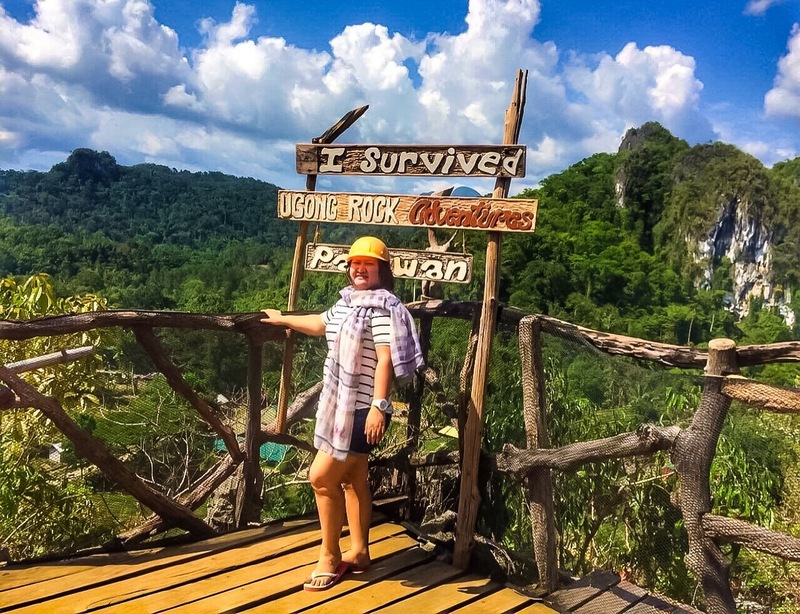 Finally, I have reached the summit of Ugong rock. 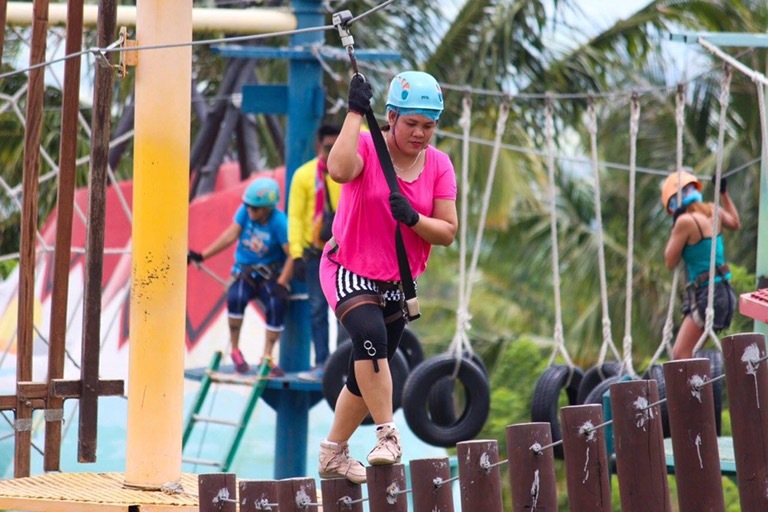 I somehow felt a sense of accomplishment even if did not try the zip line. 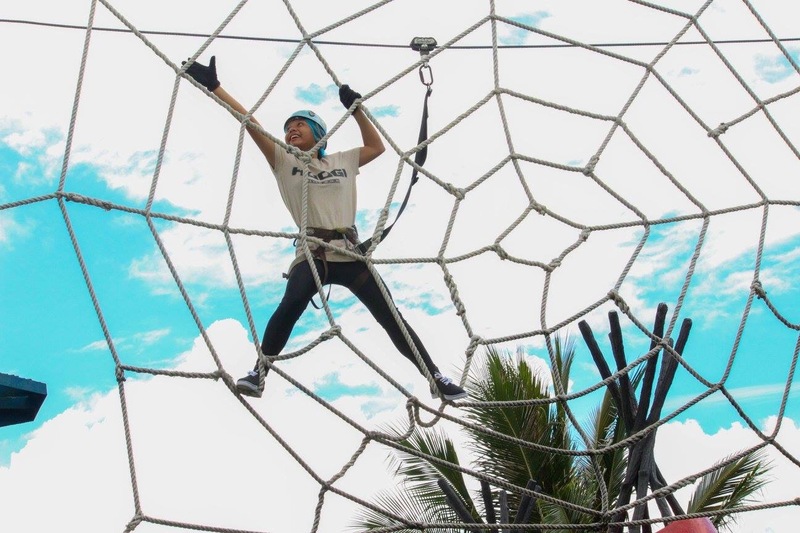 I recall how I have fought and conquered my fear of height at that time. When I was still at the bottom of the cliff I was so eager to try the zip line, but when I was already on the summit and have seen how steep the cliff was I made a second thought and backed out. I probably give a try next visit, hopefully I’ll find the courage to do so. Wow! The fascinating and panoramic view was all worth the climb. Hard work pays……fascinating view at Ugong Rock summit. Priceless! 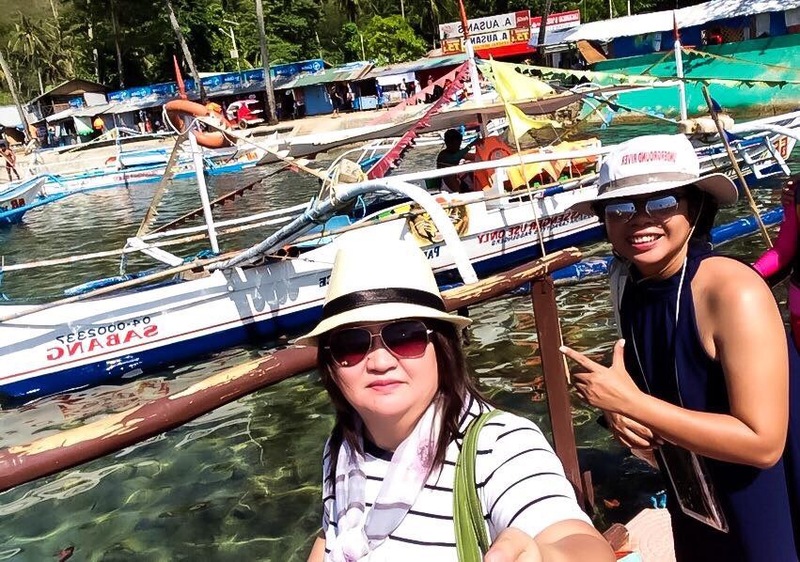 Because we wanted an adventure-packed escapade, we spent our last day in Puerto Princesa island hopping and exploring the crystal waters of Honda Bay. At first, I thought it was a huge island but learning from our tour guide it isn’t and when you reach Puerto Princesa and ask the locals to bring you to the place, you’ll never find one but many for it has 17 islands and islets and only few are open for tourists and some are already private owned. 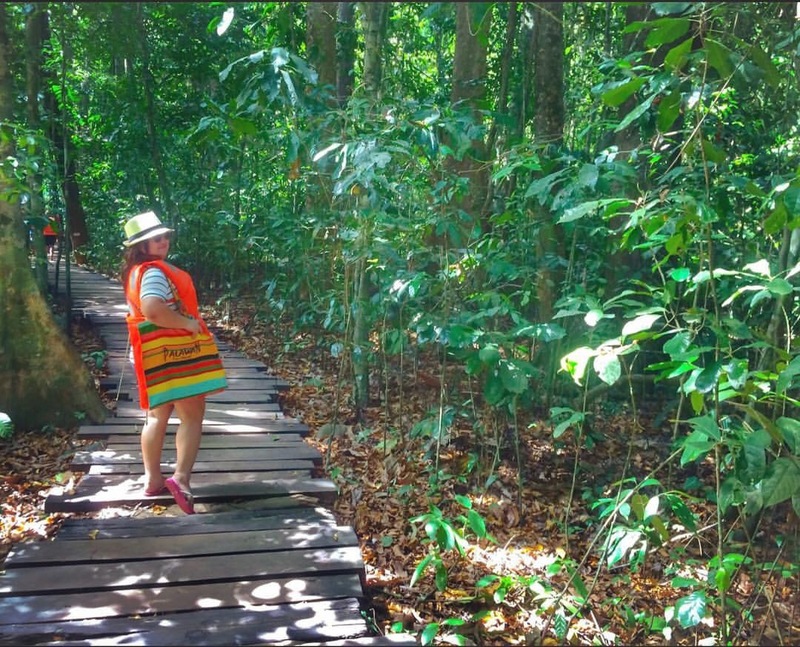 We were able to explore the three islands : Cowrie, Starfish and Luli. 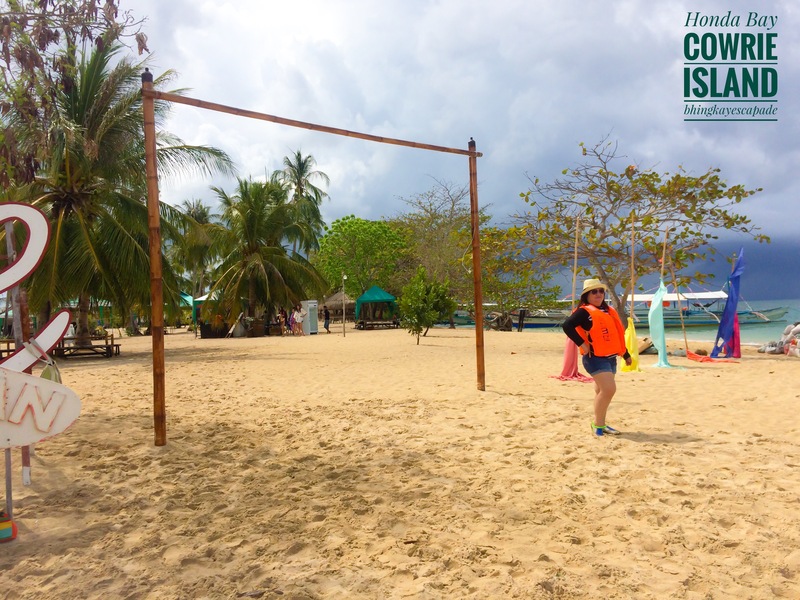 Our first stop was at the Cowrie island which named after a mollusk, a snail with a brightly colored shell. Then, after taking our lunch, we headed to Starfish island. I was amazed how enormous starfish spread everywhere in the island. No wonder it was named as such. 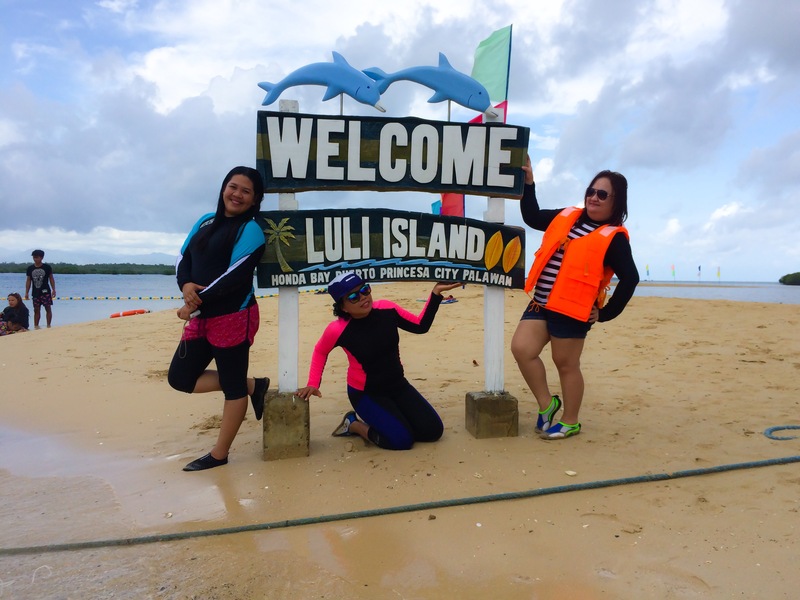 Then, our final stop was at an island which disappears or “lulubog” in Tagalog term during high tide and appears or “lilitaw” during low tide, hence, it was called LULI island. Note: Yes, that was my biggest break so far and it was so amazing for I had fun. At some point in our life, we need to get out of the cycle of everyday routine; and escape life’s daily grind and get a life. Spice it up with exciting adventures with friends, family, and loved ones. So that when you look back you can say, “Yes, I have lived my life the way I want it to.” After all, it’s your life and nobody can live it for you. Remember, YOLO. God bless! I travel to learn, enjoy, and inspire.